After several group meetings and discussions, our hypothesis and charge has taken shape. 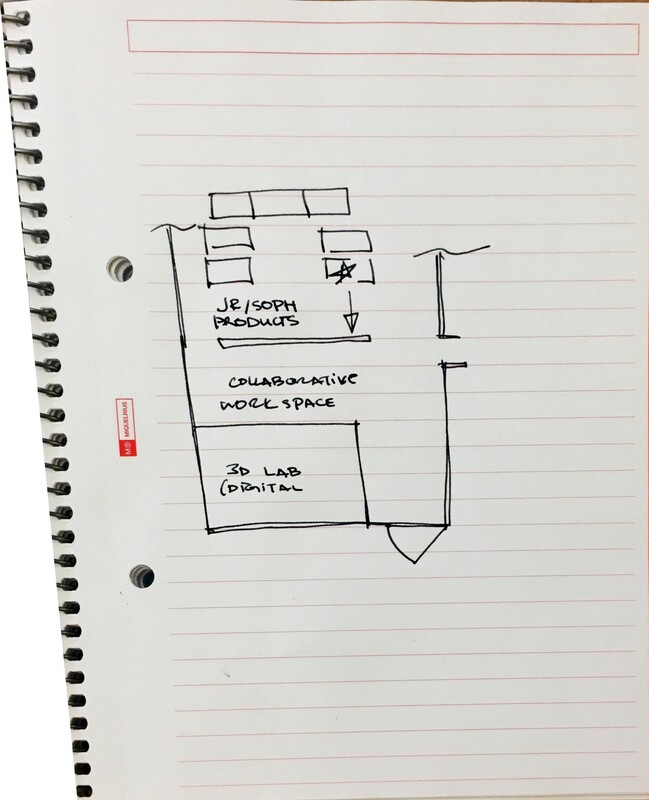 We aim to create a form-based research method that assists product/industrial designers to shape UX research into aesthetic forms. We’re thinking specifically of targeting the academic setting and promoting exposure to sensitivity of form through play and discovery. 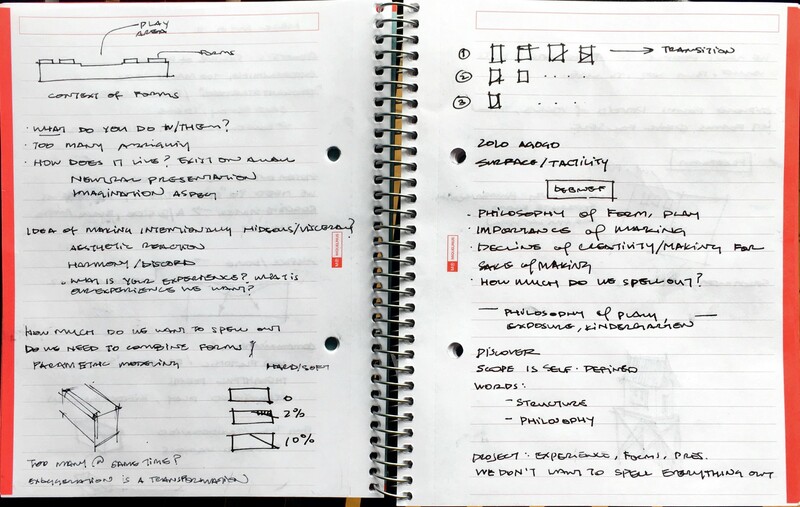 Currently, we are in the research phase — interviewing product design professors about their process from research to form, as well as reading up on articles relating to form semantics and industrial design research. 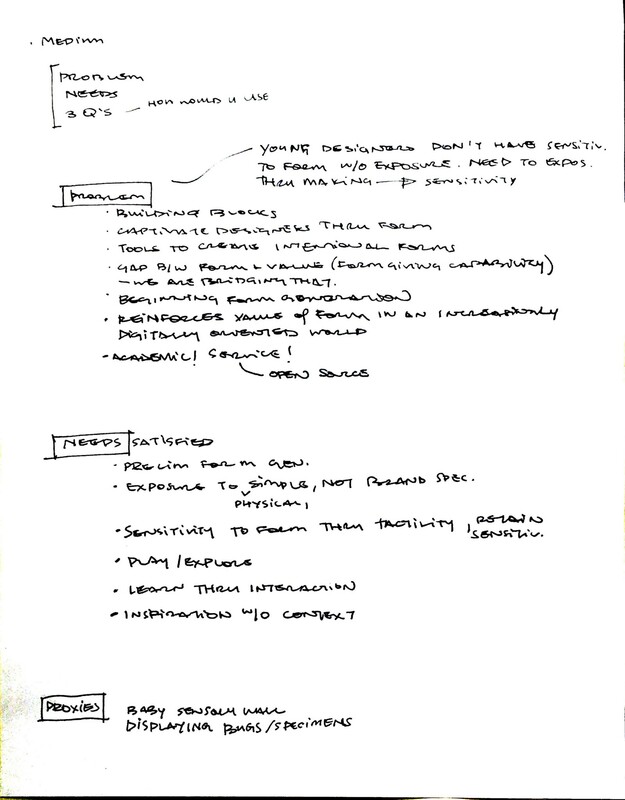 Below are some notes from discussions and feedback sessions. 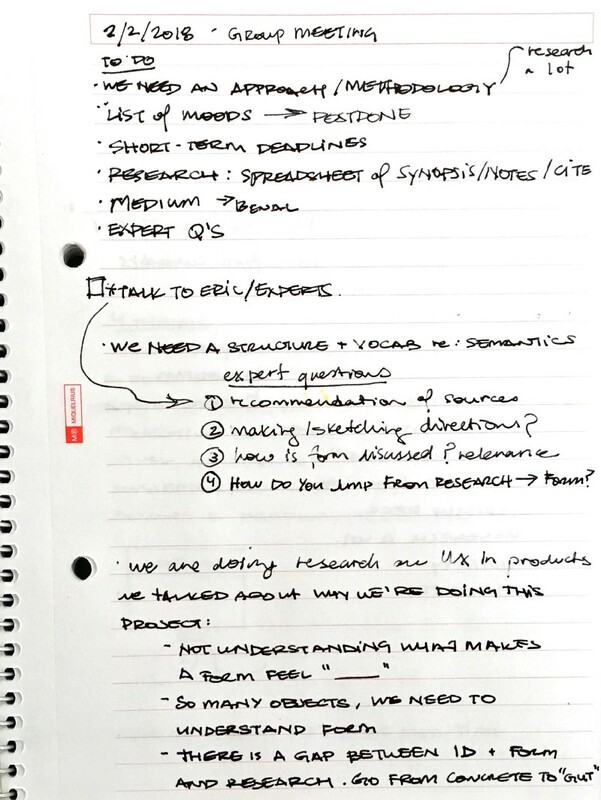 Trying to figure out what the meat of what we want to learn is — feedback from professors on rightmost side. 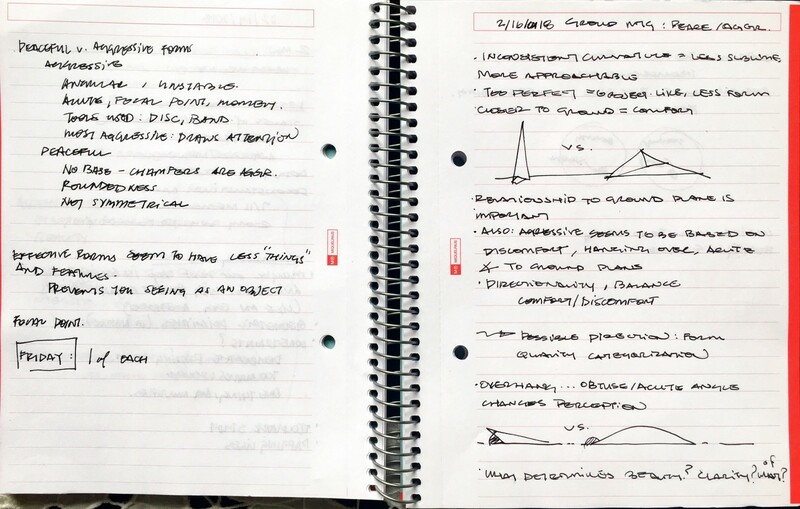 starting a long-term project is always challenging at the beginning — there’s productive discussion, but there’s the struggle of defining direction without becoming too restrictive and specific. 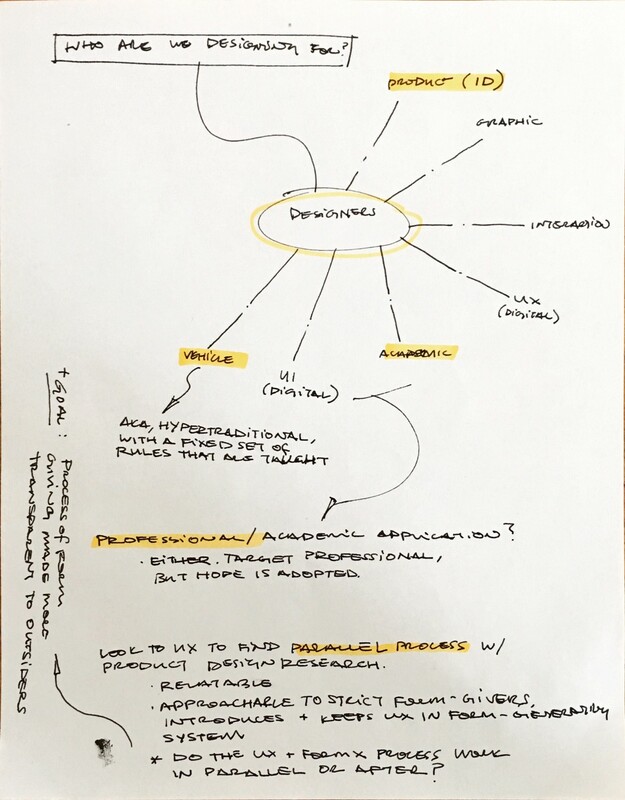 Here, we were drawing out how we were thinking about where we were in the project now in order to remain on the same page regarding direction and next steps. Trying to determine scope, stakeholders, and who we are designing this methodology for. After each group member recovered from various strains of the flu, we were finally reunited and could lay some more groundwork and make aggressive steps towards defining our direction(s). 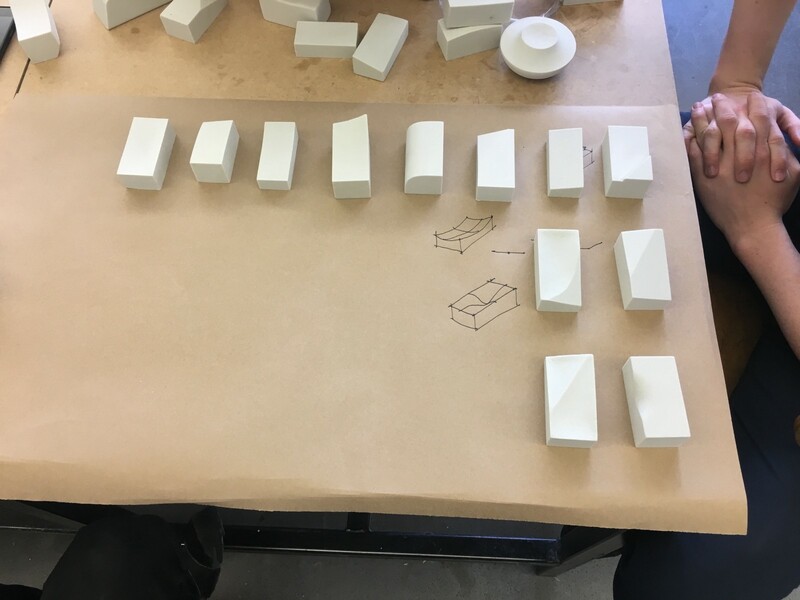 After meeting with Molly and Kristin, we decided to take a step back from defining a concrete “research method” for form that we were going to follow this semester and instead would make the method known through our own form explorations. 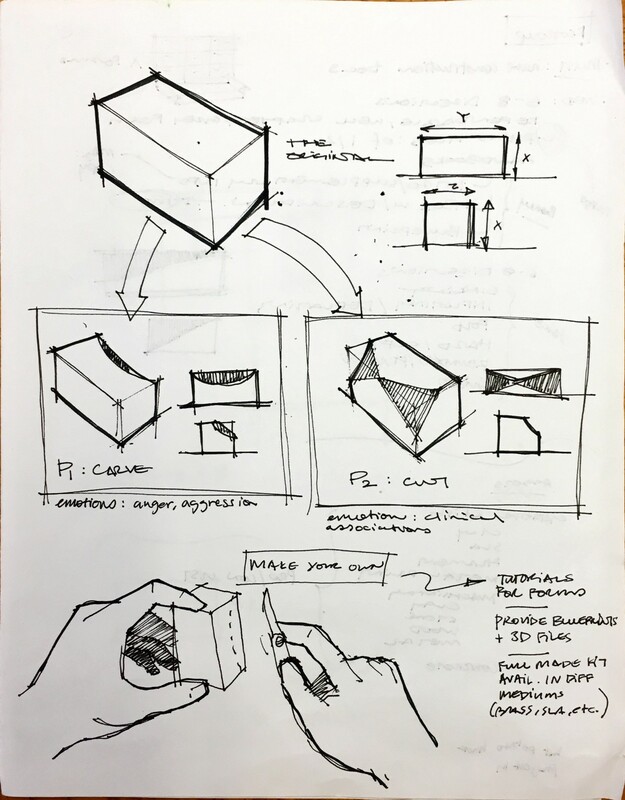 We pseudo-defined the current process of making forms (see picture above): [dry research, constraints] -> [making things with constraints and knowledge of form] -> [first feasible, usable iteration]. We want to focus on the “making things” part of this equation. 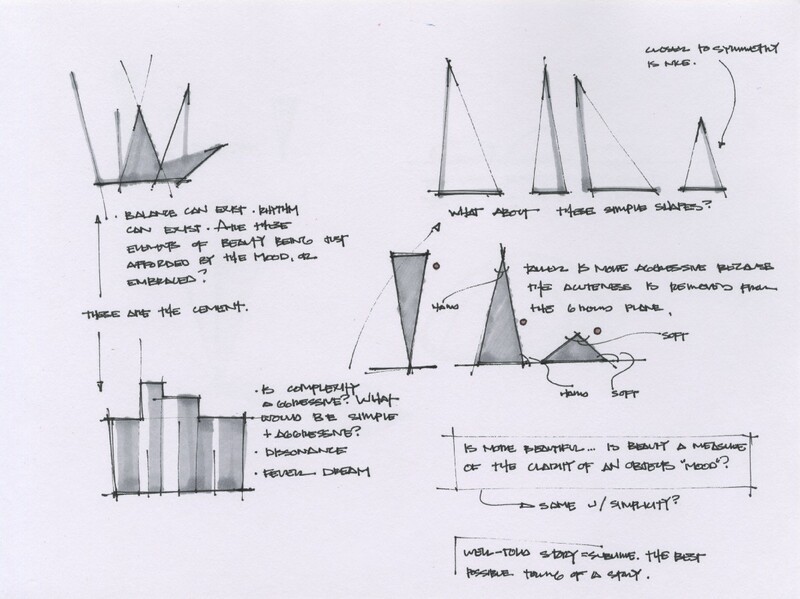 How do we go from research to an actual “thing?” How do we determine that what we designed is beautiful and how did we get there? 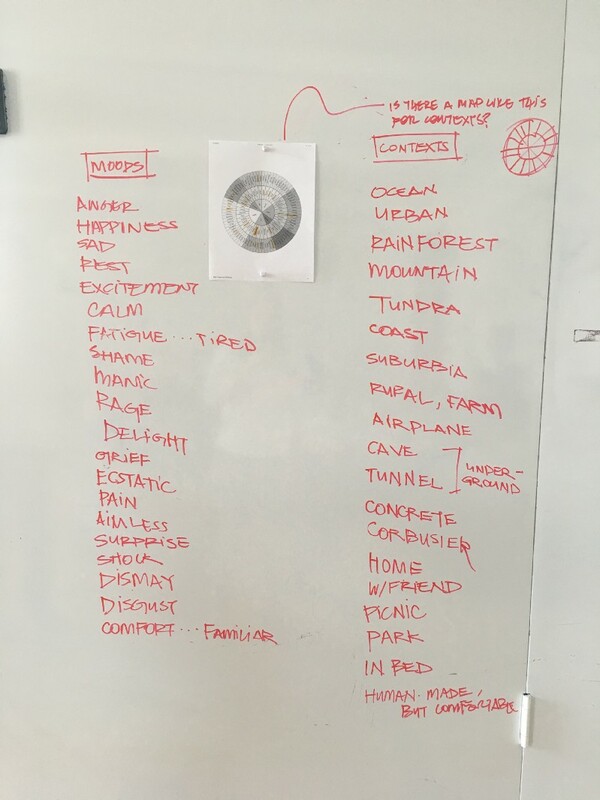 Using our research from Del Coates’ “Watches Tell More Than Time” and Krippendorf + Butter’s “Symbolic Qualities of Form,” we knew that we couldn’t make a methodology for forms without some sort of context, whether that be mood or physical place. We decided to make a series of forms, based on a mood wheel, for the purpose of discussing how mood/context affected their forms. 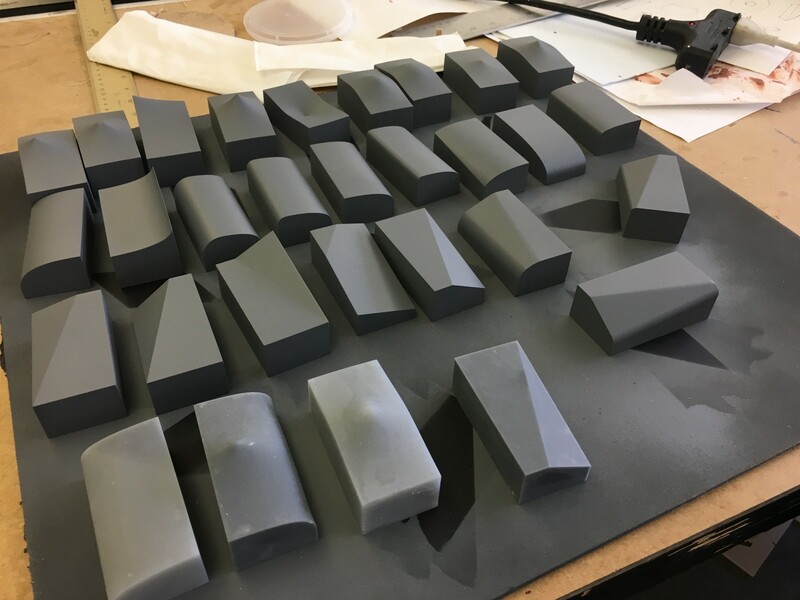 We also decided to keep the finish quality and scale consistent: grey foam that was about hand-sized. We also wanted a way to contrast some of these moods, so chose an opposing pair of moods. Our first exploration was on peacefulness/aggression, with each of us bringing in 3 examples of each mood. Today we met and discussed the quality and semantics of our forms, as well as any initial reactions and logistics regarding the forms. 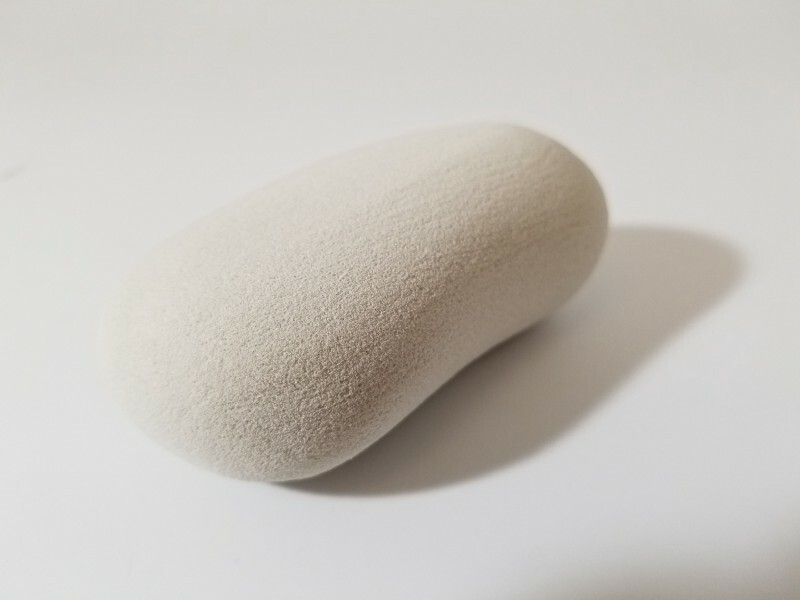 First, we came up with some additional constraints for our forms: no toolmarks, as it distracts from the forms we’re making, as well as making an object out of a single piece of foam. 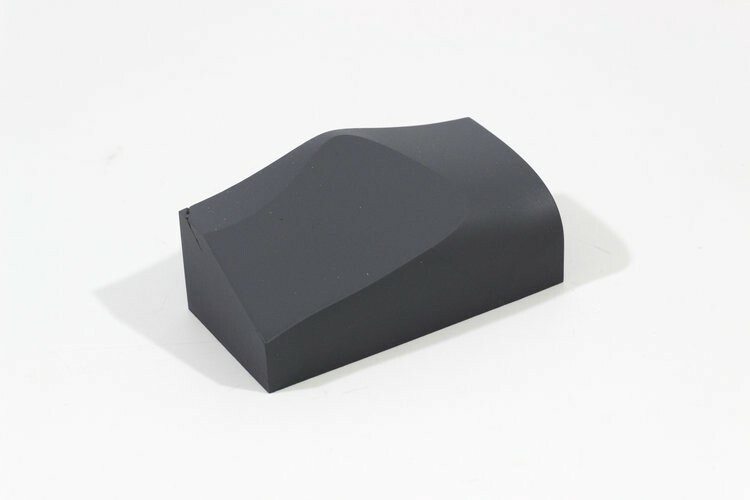 When multiple elements were attached within one “form,” it made it hard to evaluate based on any other forms that were shaped from one piece of foam. We organized the forms on an imaginary xy matrix to aid us in comparing the vastly different forms. The x-axis was organized from most aggressive — least aggressive and the y-axis was organized from least satisfying — most satisfying. 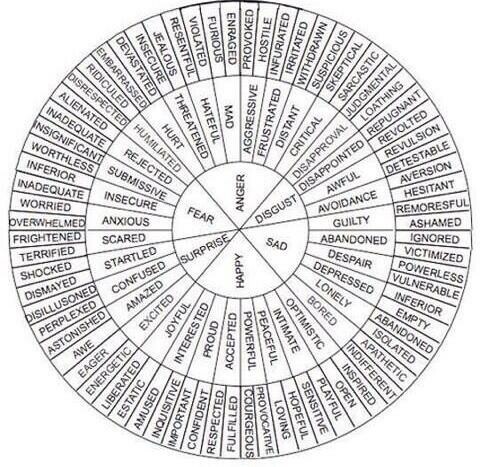 This helped us ask the question why or why not the form was successful in conveying the proper mood. left: evaluating the forms from most aggressive -> most peaceful on an xy matrix. right: all of the more successful forms together. A sampling of the calm/aggressive-associated forms. As this project has progressed, we find ourselves rapidly approaching a halfway point with less than we’d like to have at 50% through the project. It’s currently time to really nail down where we’d like to be in the final week, and what we’d like to have to show our process and where we will have arrived. Our last week has been productive. In exploring specific features of forms we created, we’ve had conversations about the specific ways emotion manifests itself in form. So far, we’ve discussed emotions and some forms that convey specific formal qualities. We’re at a point now with a plethora of different forms, and we are eager to continue development. It is only now that we must discuss whether we are moving towards an exploration of form itself, or more specifically human emotion triggered by formal qualities. We do think that right now, we’re stuck in a rut of subjectivity and need to find a more objective way to talk about form. Ultimately, we hope to explore how things make us feel. Moving forward, we may make more forms derived from actions. Specifically, what action is a form performing? 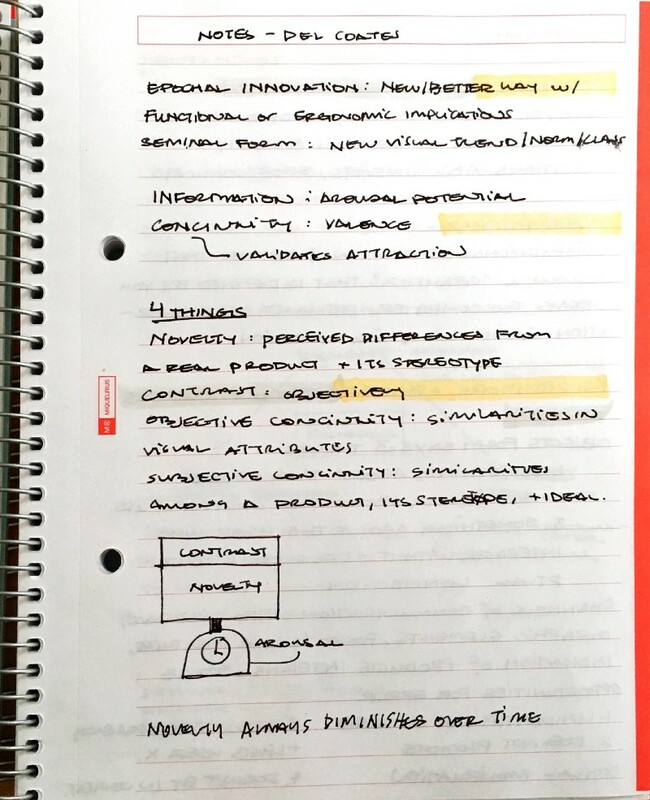 Our previous iteration was feeling -> form -> feeling. We’d like to try action -> form -> feeling. 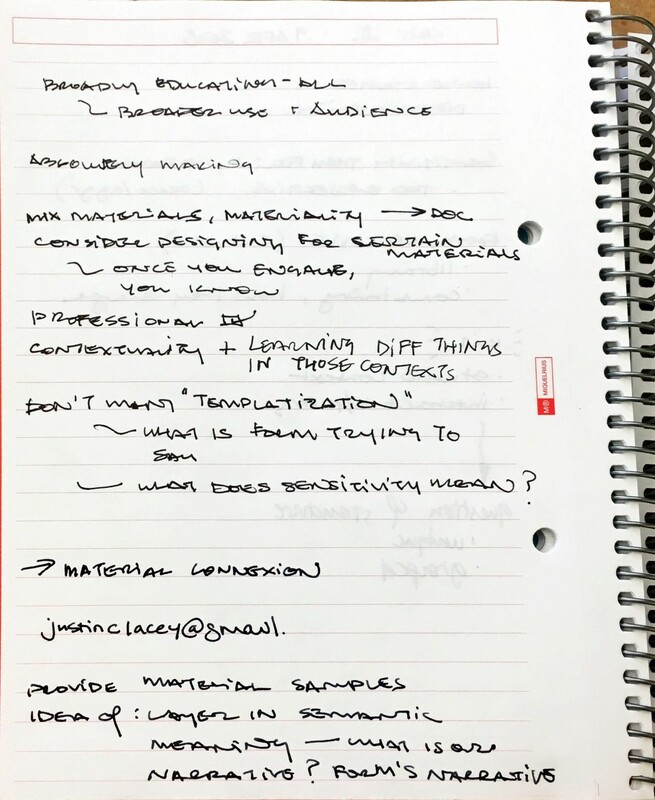 Today, we met with Mark Baskinger to discuss our thoughts on our capstone with him, additionally hoping to trigger a discussion about form and semantics. 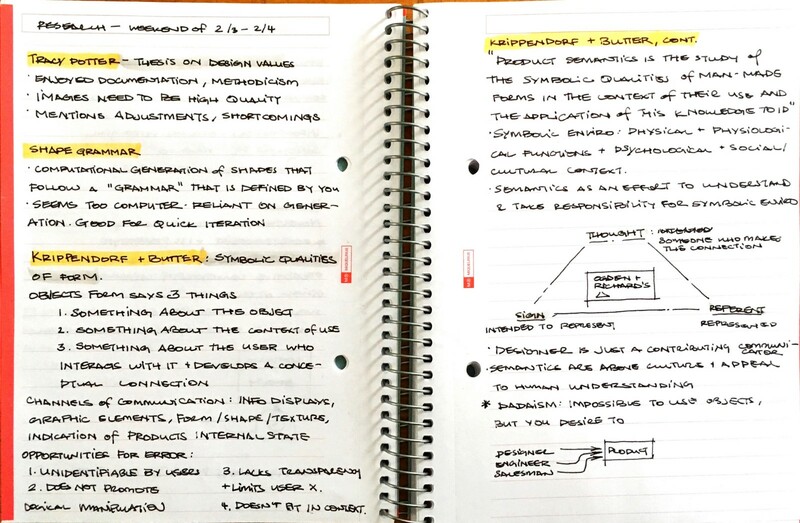 Our discussion was incredibly productive and helped our group see past our mental block of subjectivity. 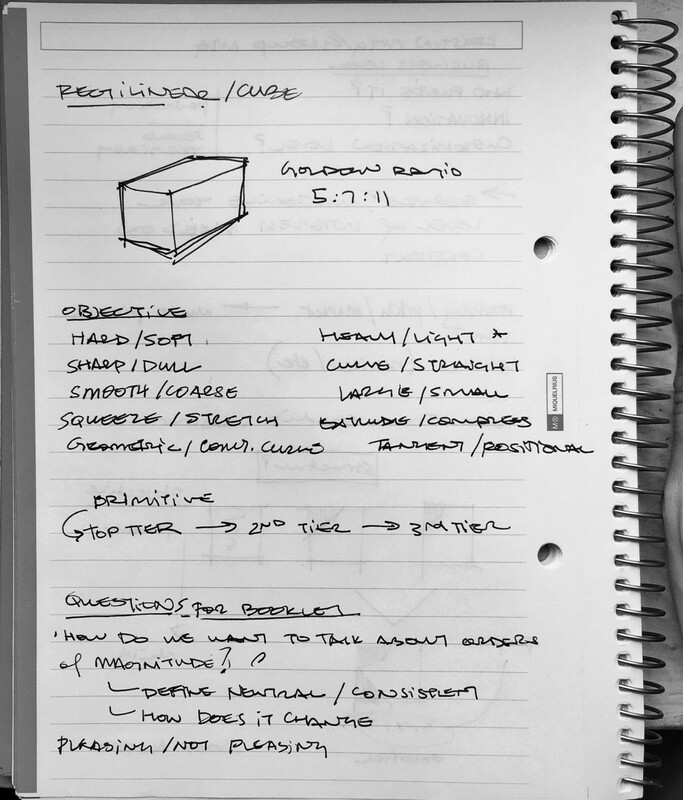 Mark told us about how seeing an object for what it is — a combination of completely objective qualities and characteristics (soft, hard, sharp, etc) — is what determines how a form makes people feel/evaluate it. This is what we’d been missing: looking at the objectivity of form to determine how its meaning changes. 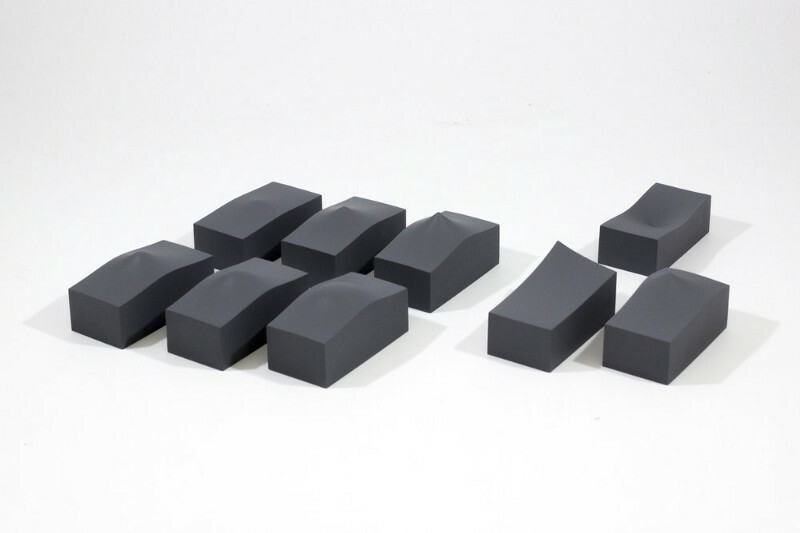 By separating the meaning of an object from its materiality, we can understand why a form makes us feel a certain way. 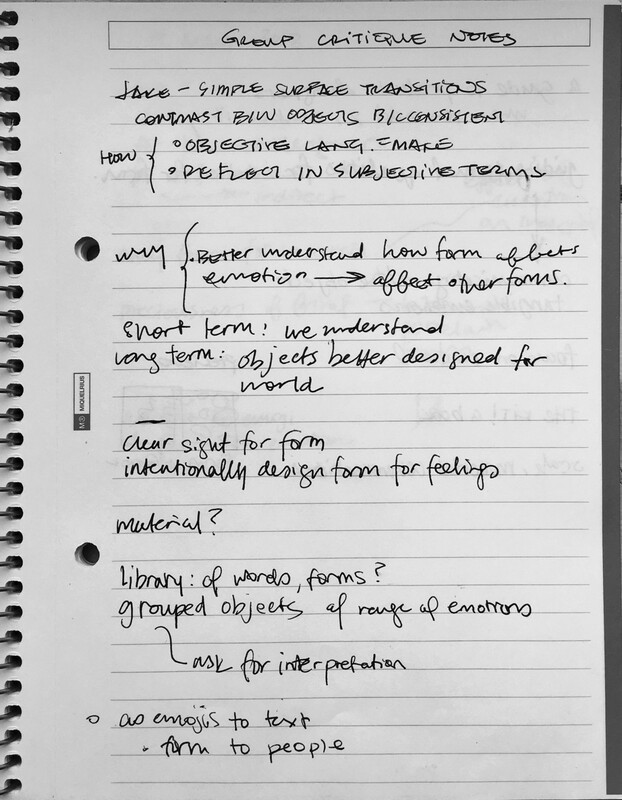 After an incredibly rich discussion about form, we came to the conclusion we need to making even more forms to understand how to talk about form. This is actually somewhat relevant to transition design — thinking about objects and forms in the scale of their time can change how we consume and create a paradigm shift around consumption. For example, imagine you live in a house built in the 1900’s. If there are owners of this house every 10 years, that’s about 11–12 owners in the lifetime of the house. The house only knows how to be a house. It can be eternal. That being said, we see a house only for the time scale that it is pertinent and helpful to us and our lifetime. By changing how we see the time scale of the house more as a lifetime of the house’s existence instead of as the house’s relevance to us in our lifetime, we can change how people might treat the house. We want to create a deeper understanding of objects and the paradigm shift we could potentiate by changing how people see objects. Part of this is through making and understanding how these aforementioned combinations of objectivity create subjective meaning and the other part is a healthy dose of form philosophy and semantics. 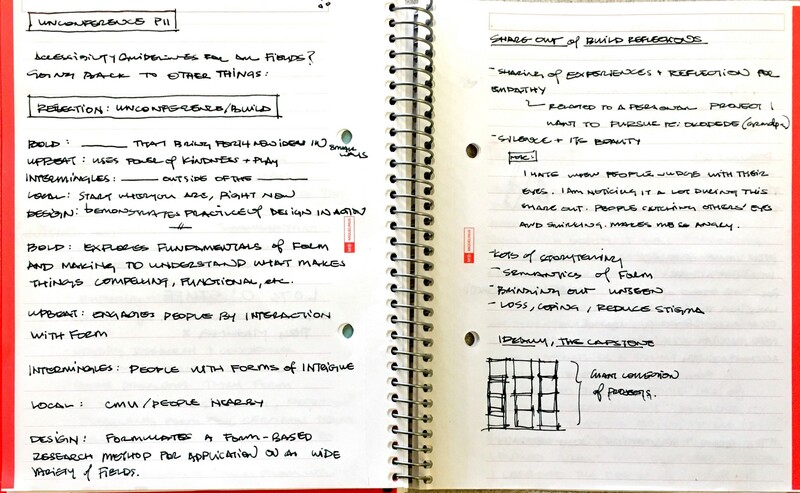 Products will always be relevant — but how do we talk about them to everybody in a meaningful and productive way? These are the current thoughts on our minds that we will present next week during the group critique session. 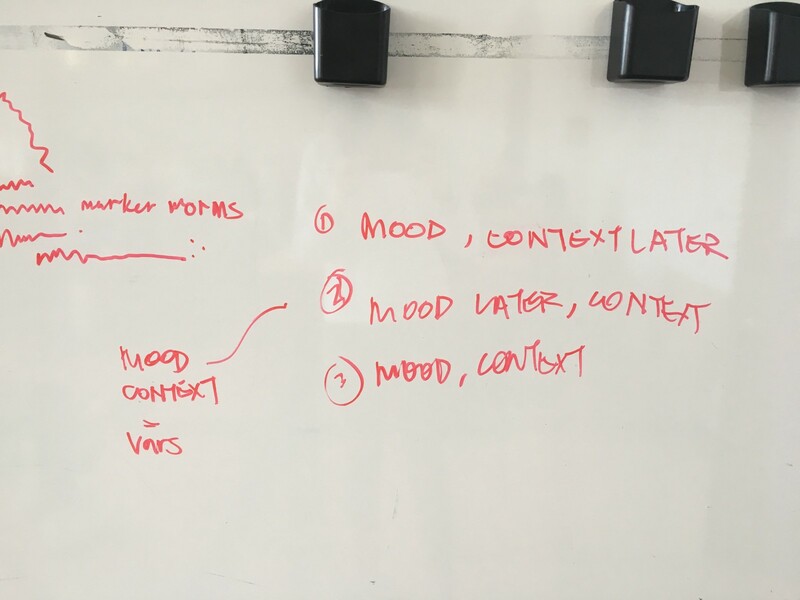 Today, we met with two groups dealing with tangible interactions and engaged in a group critique session to figure out how we were going to take all the thoughts floating around in our heads and turn that into a deliverable. 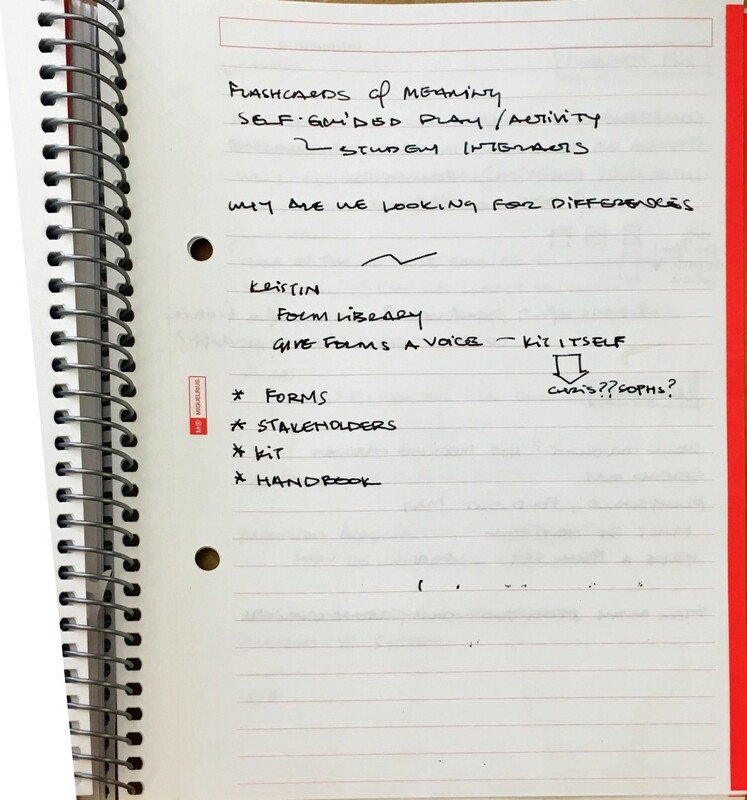 We brought up that we wanted to create a way to talk about form with people, intentionally designing a library of forms for feelings. 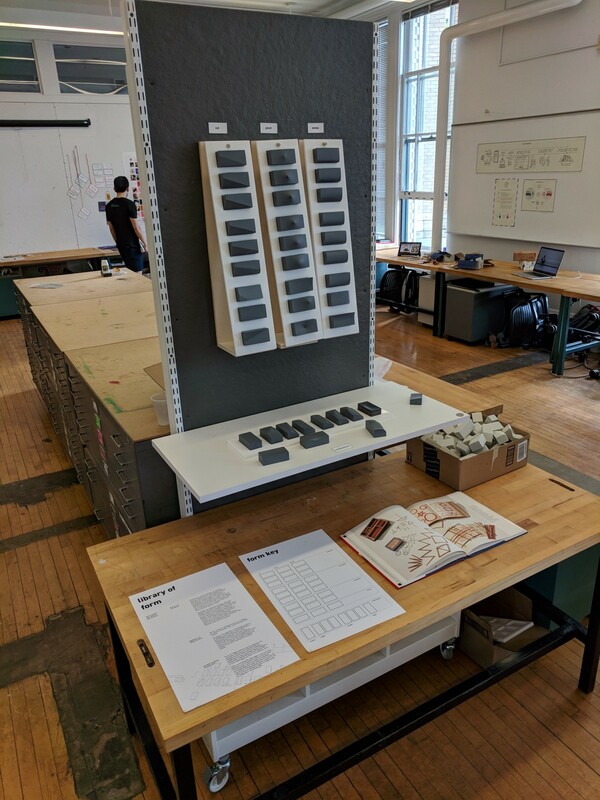 We received some wonderful feedback, most notably the excitement about the potential of turning our library of forms into a shareable “kit” that would be used for emotional form discovery. 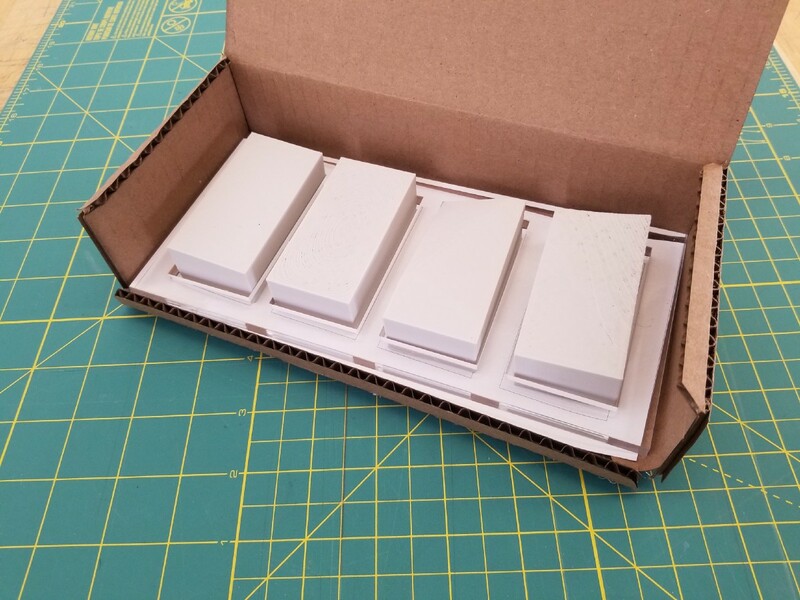 It would be a box of 3d printed/machined/wood forms that included a small handbook of questions and philosophy behind the forms. 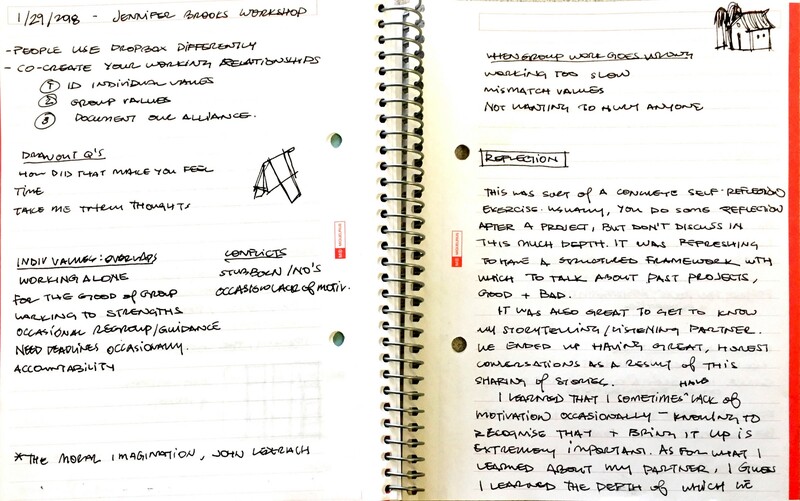 Our group got incredibly excited about the potential for this kit and we could see it being used in a bunch of different contexts: professionally (for self discovery or for communication with clients), academic, personal growth. The versatility of this kit would allow for a deeper understanding and appreciation for semantics in form in a variety of different contexts. While we’re excited about the potential of this project, we still have some things to figure out for next class: what material will we use? How many forms will we include? What content will be in the brochure? We’re excited to tackle these questions. 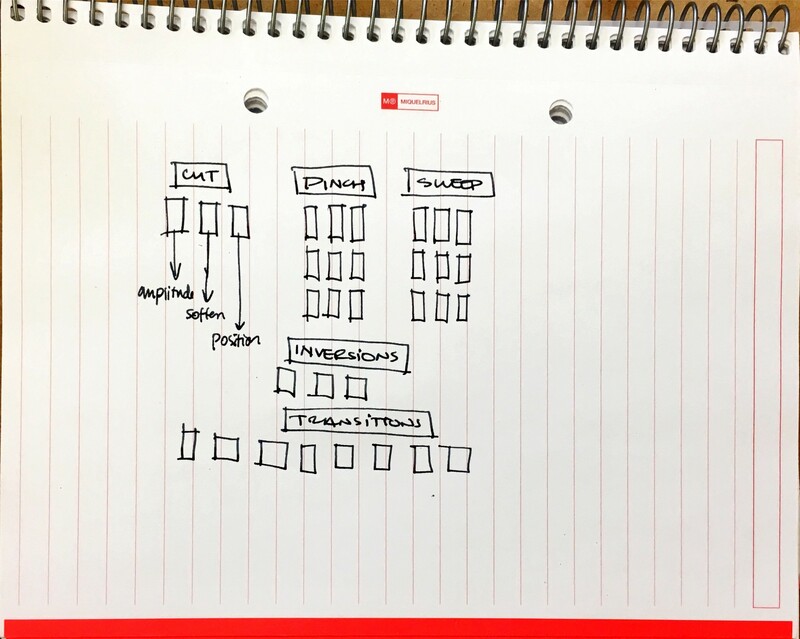 This week, we worked out a lot of logistical details related to what we wanted our deliverable to be. 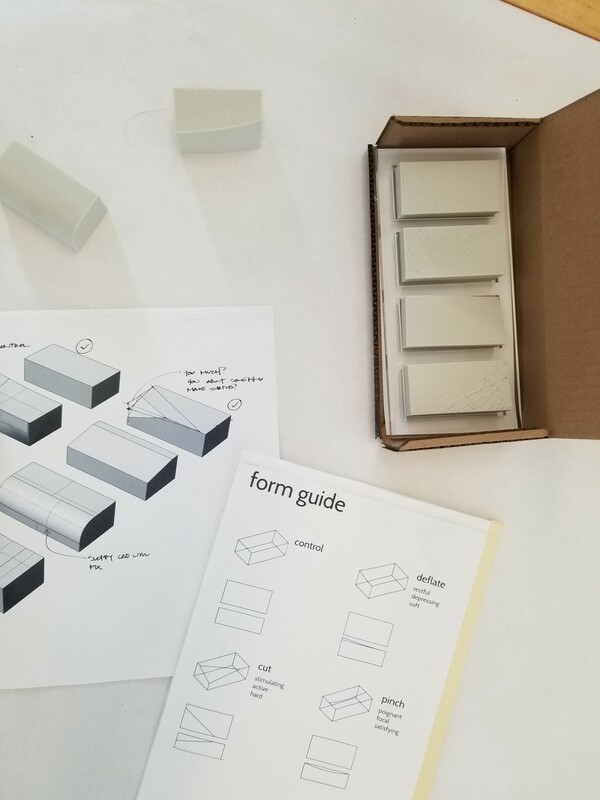 A brief meeting with Kristin and Molly helped us realize we needed to figure out our main stakeholder and contextual group, so we decided to market this kit to students in design/engineering fields. In addition, Kristin gave us great feedback about our potential business model: who is paying for this and how much does it cost? 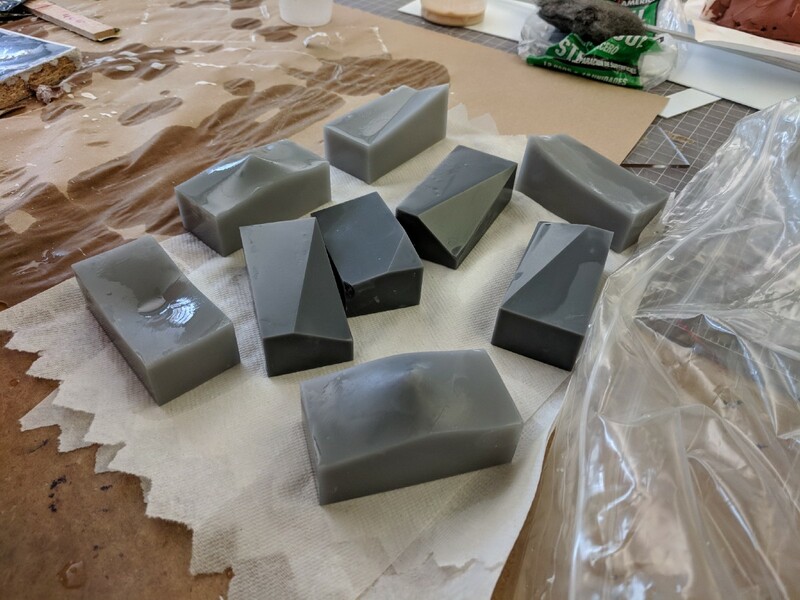 We decided to continue prototyping in grey foam, but will prototype one of the final forms in a variety of different materials based on cost and availability; alumide, SLA, PLA, slip cast porcelain, and press molded clay. 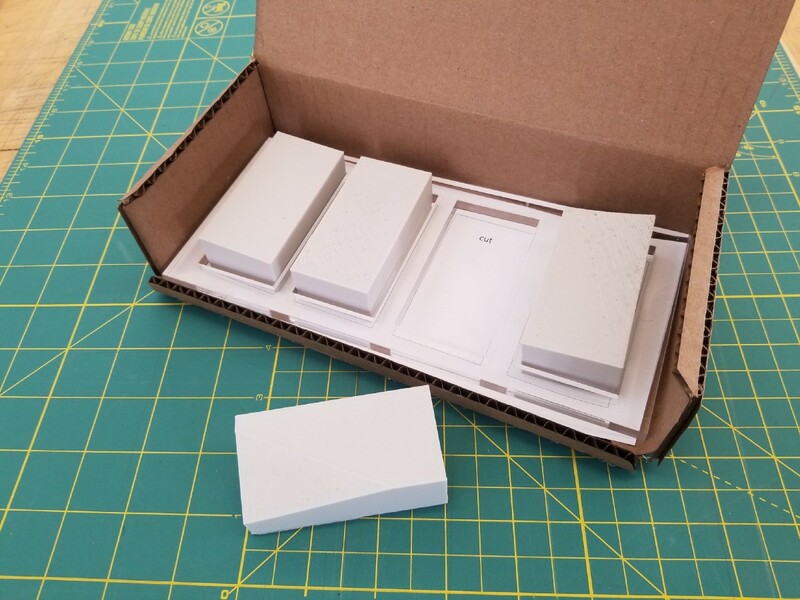 The reason we’re prototyping with all these materials is because want to make sure this kit is seen as not only educational, but also precious and approachable. 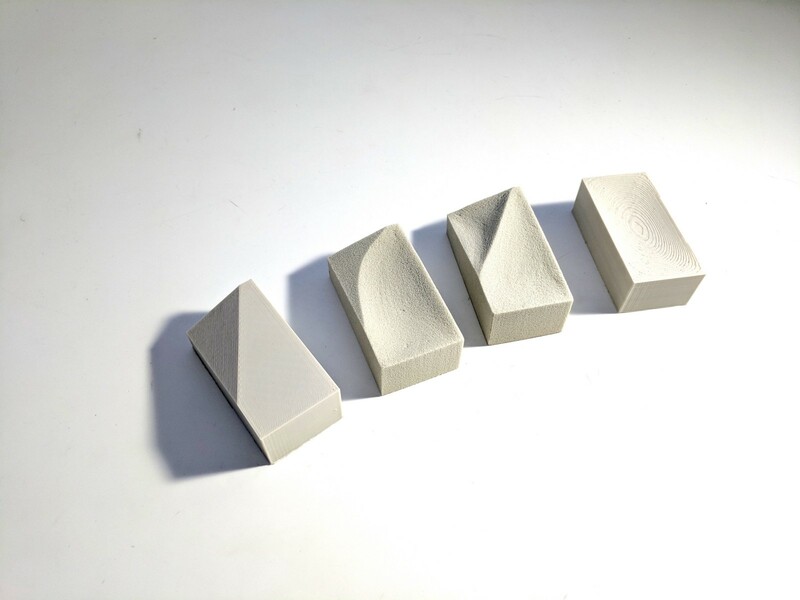 We also determined the structure of our kit of forms: we will have one primitive form (a rectangle), then subsequence linear transformations of the primitive. This is to show how altering the form with objective transformations (push, pull, cut, soft, hard, etc) can produce very subjective forms that fall within a certain category of emotion. 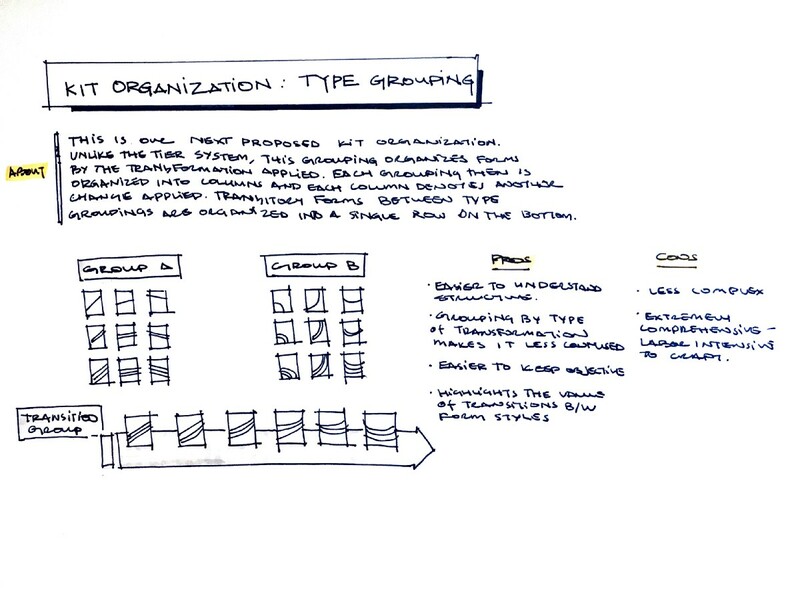 The linear transformations will be our “Tier 1” group of forms that demonstrate simple, basic form transformations. 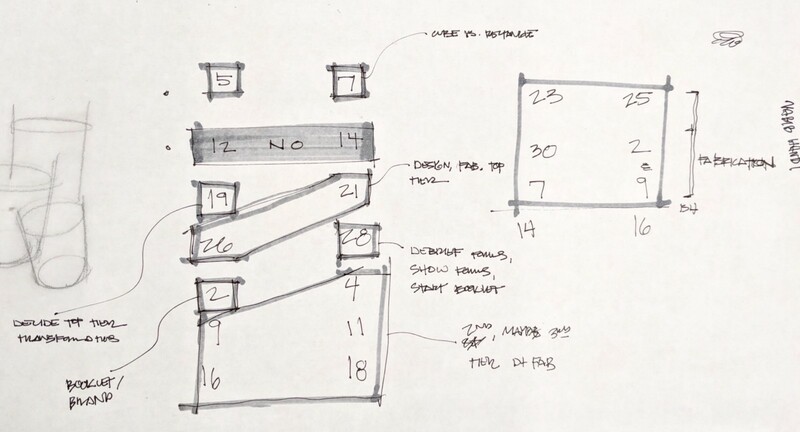 We will combine Tier 1 forms to create “Tier 2” forms to show how the combinations of these objective form changes can create greatly varied results. The reason for our desire to combine elements is that the combination of objective changes creates subjective/human meaning in form. Currently, we are working towards developing these forms and their transformations. Spring break is coming up, so more updates to come after the break! Class time today started with a briefing about regrouping and re-centering our goals, as well as pushing to create some tangible, low-fi prototypes of our respective projects. We took this opportunity to really push to prototype over the next two days and making decisions we had previously hesitated to make. 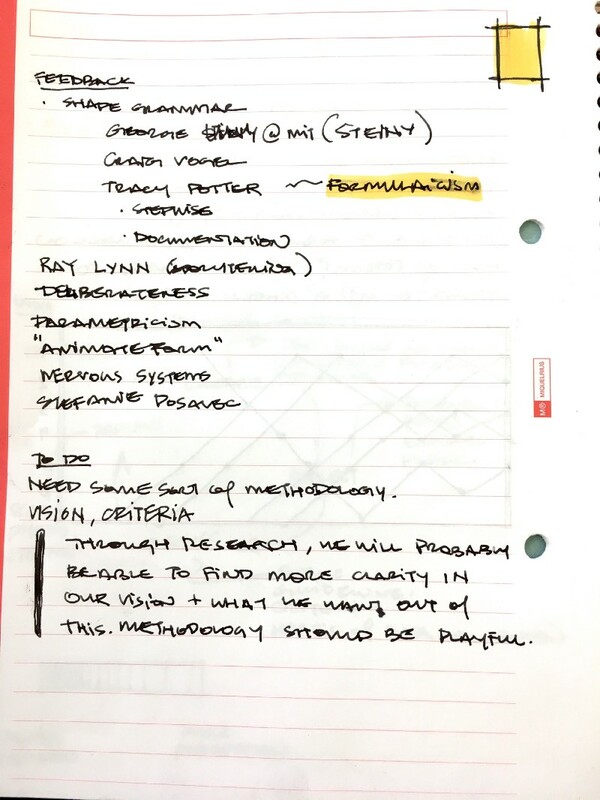 The main decisions we needed to make were what objective form changes we wanted to examine and enact on our forms. We decided that for Wednesday, it made sense to create a group of 4 forms that we could design the kit for. We also decided, on a high-level, what content we wanted to include with the forms: blueprints/isometric views so that a user could make their own forms, an introduction into why we are doing this/how to use the forms, and a breakdown of each form. We created a sample of four objective Tier 1 transformations to discuss during our critique session on Wednesday, as well as a mockup of our handbook that we wanted to include with the final kit. Today, we had another wonderful group critique session with two other groups in our class. We showed our mockups we made and came back with some really great feedback! See below. what do people do with these forms? at a novice/intermediate/advanced level? how are we distributing these forms? 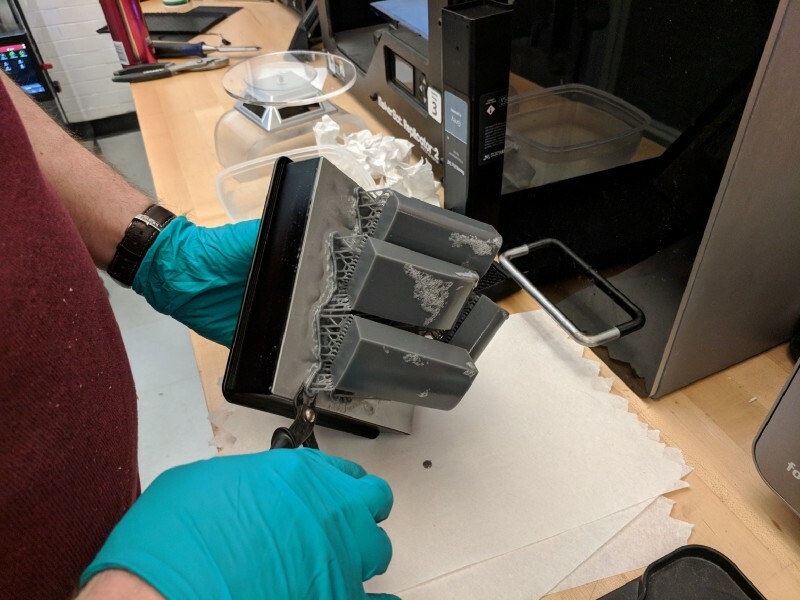 Is it an open source library or are we manufacturing them? how do we make this elevate to an educational level? 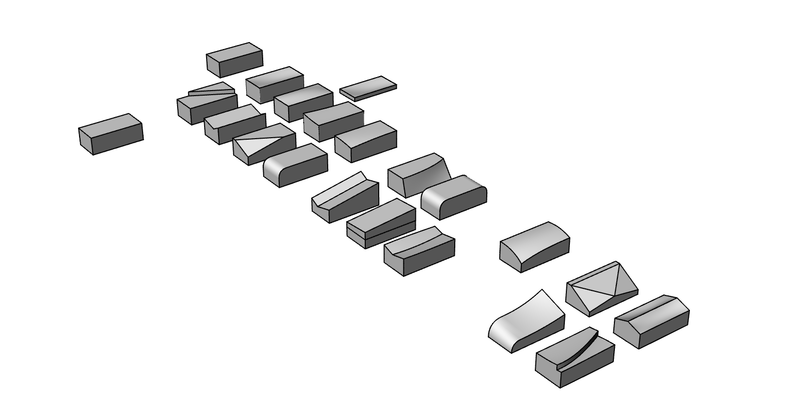 is the rectangle the right shape to communicate these form differentiations? do we need real world examples to compare these to? how do we connect these to the real world? — its too abstracted. 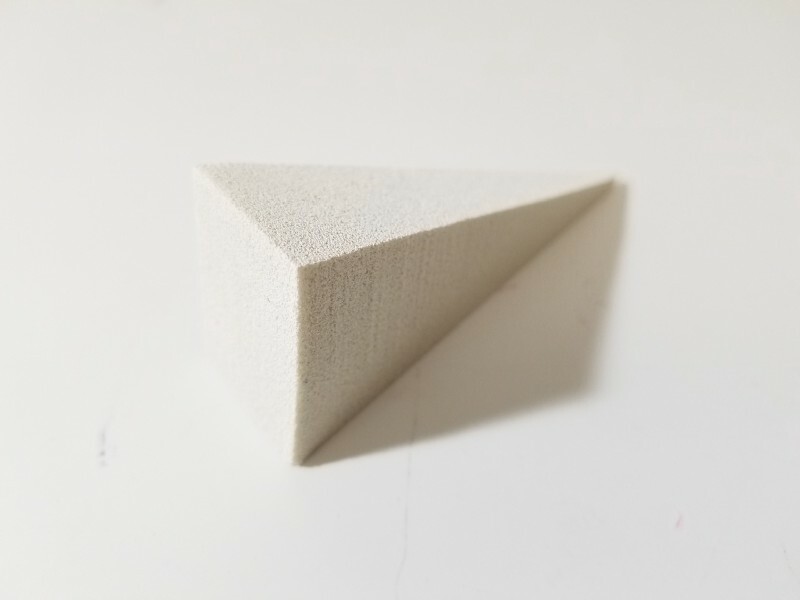 Don’t connect it to a super concrete thing, but how do we connect it to the real world? is the scale not conducive to what we’re trying to communicate? test this w/freshmen! how do we actually use it? we need further development in the combinations of form transformations to help flesh out our idea fully? 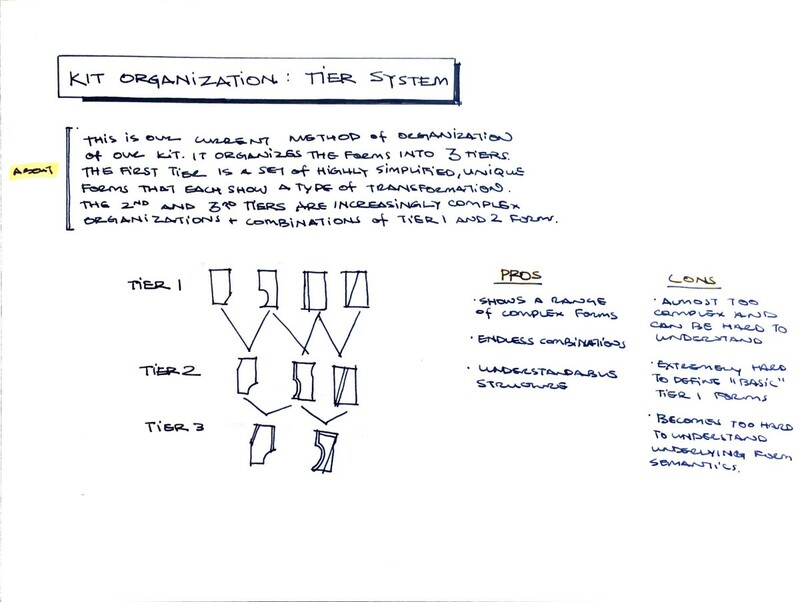 how do we structure tier 3? is it a combination between tier 2 + tier 1 or 3 x tier 1 forms? 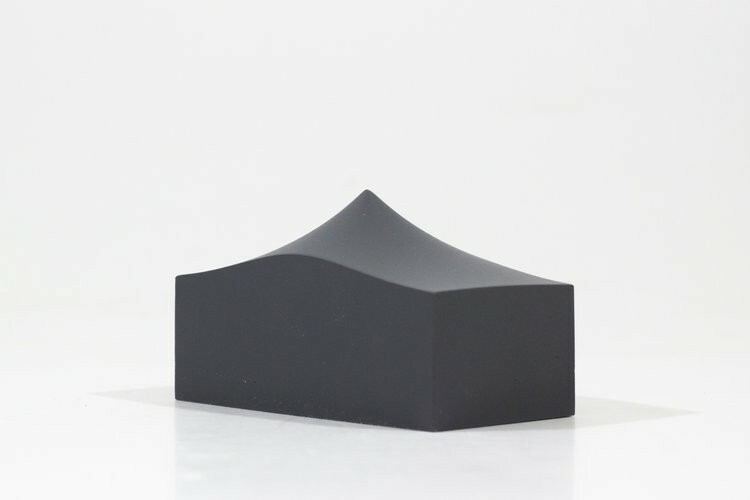 this project is not only about subjective meaning, but also the interactions of form. 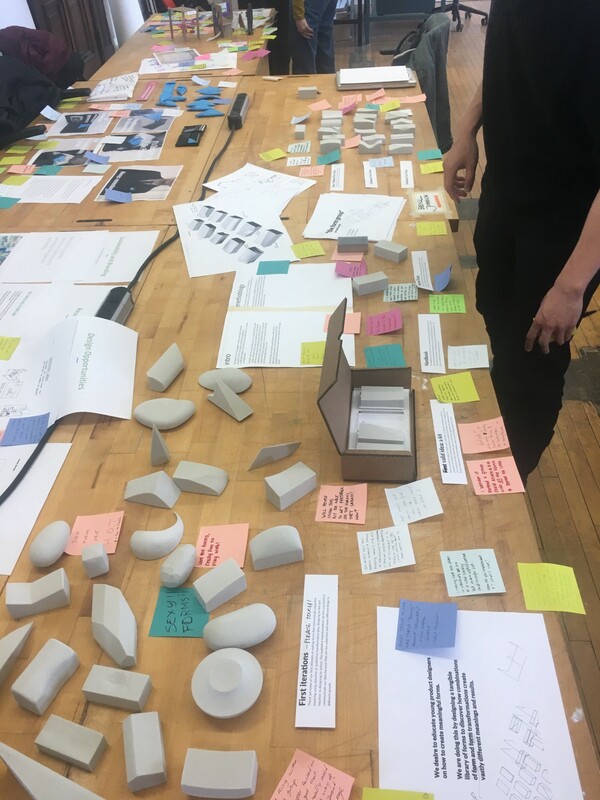 value given + timeline: the value of this project is the opportunity to expose yourself to and interact with a myriad of different form transformations creates a deeper understanding and serves as inspiration for product designers and makers in society and academia. who are we designing for? : teachers, students, potentially university-scaled. 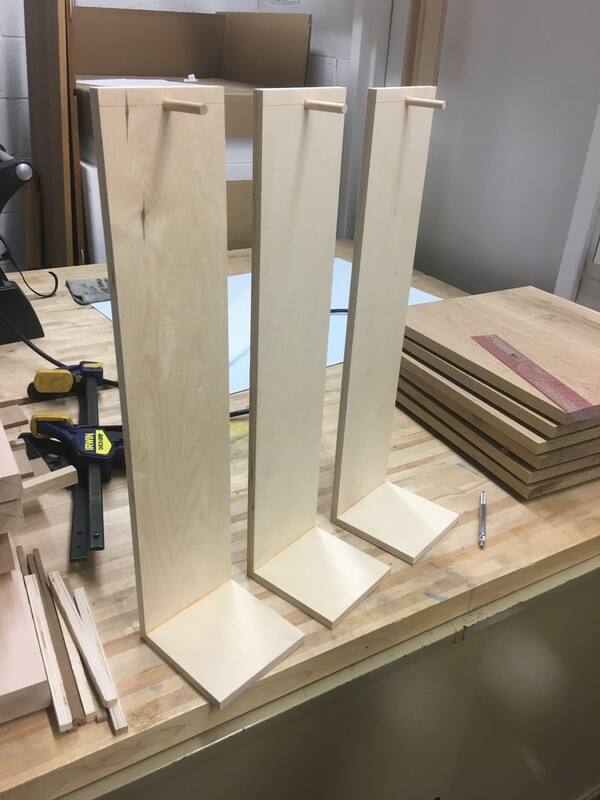 expand tier 1 greatly and choose our final tier 1 forms by the end of the week — this is because we think that tier 1 is the foundation upon which tier 2/3 is built off of and serves a more important role to the form kit. We’ll determine the tier 1 forms through rapid and constant iteration. 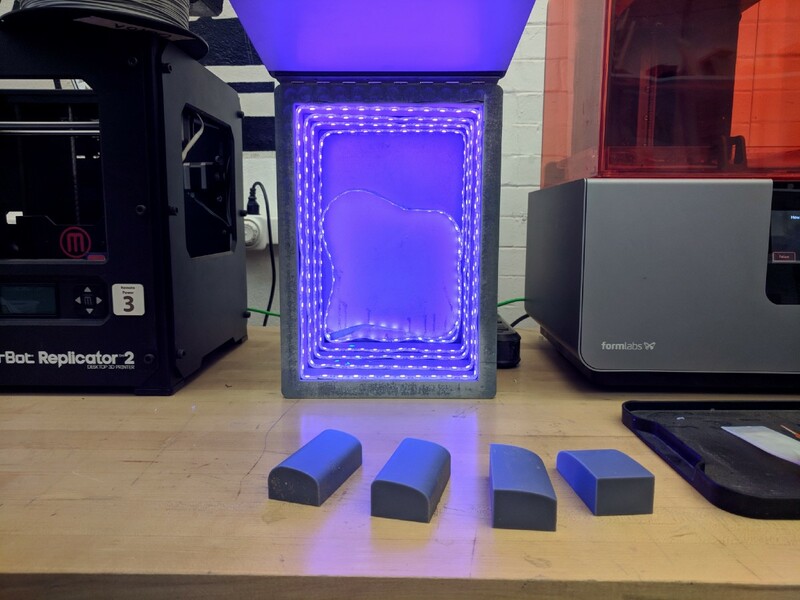 choose a form to test out on different materials — this is to showcase the value of material choice and also to determine the ideal material that has the finish quality we want others to use. 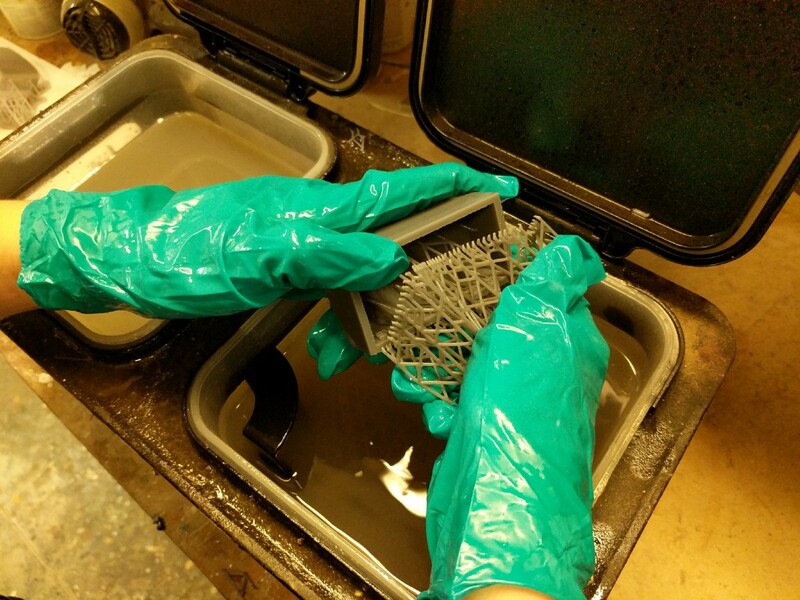 We plan on trying stone, 3D printing (in SLA, alumide), wood, resin, and concrete. today, we focused mostly on discussing how to finalize our tier 1 forms, as well as our methodology for developing tier 2 + tier 3 forms. We determined that for any forms that involve 2 transformations (aka 2 features), that would be a tier 2 form. A tier 1 form then becomes forms with a single and simple transformation. the whole set of tiers is a series of transformations or combinations of tier 1/2 forms. That being said, we need to resolve the issue of communicating transitions of forms to the user. We’re worried we’re getting too in the weeds in some areas, but not getting detailed enough in others. Some things that we might want to talk about in the handbook that accompanies the forms are: exaggeration of forms, inverses, and the differences between form + feature. Today, we had a silent crit session in class where each group had the opportunity to receive feedback on their project without any introduction about the project. 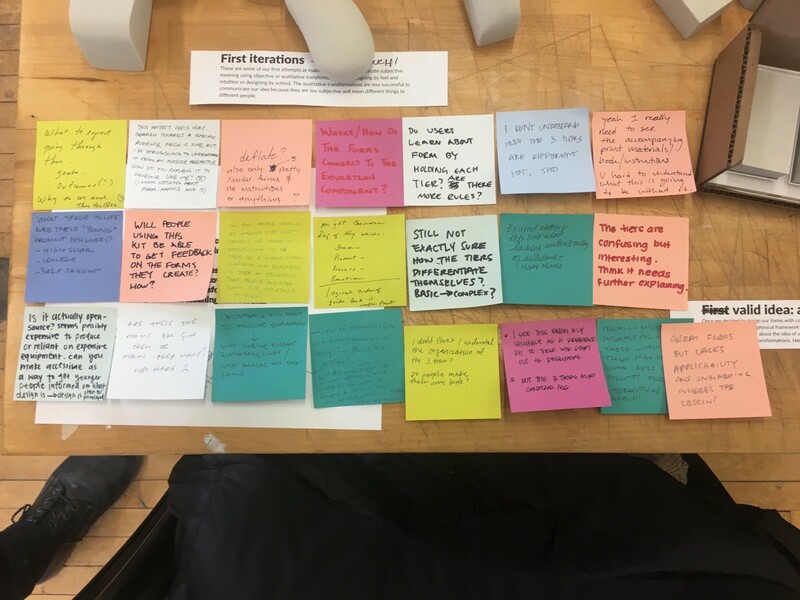 Everyone’s deliverables/project descriptions were laid out on the desk and classmates went around and placed post-its with their feedback on the desks. our desk layout with labels and our progress so far — each post it note is a classmate’s feedback. I would say this crit session was extremely productive for us! 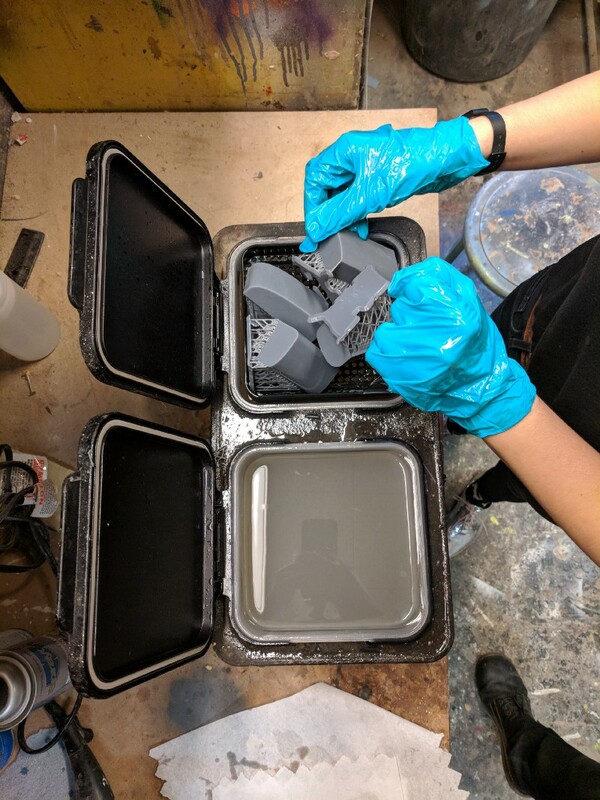 We were anticipating a misunderstanding of our project since our target users are so niche (young product designers in training) and also due to the fact that we had gone so deep into developing the forms themselves that we may have underdeveloped our accompanying print/informational materials. 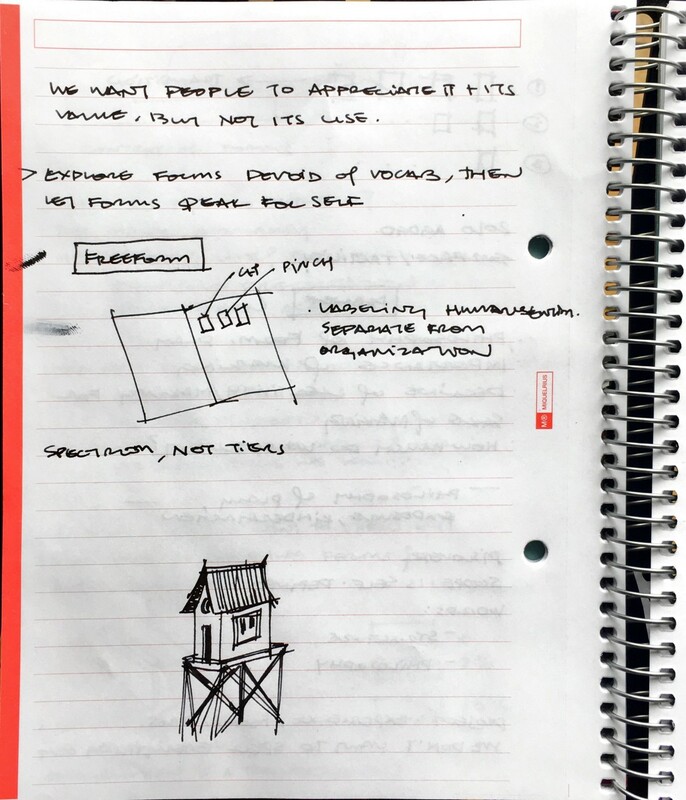 Ideally, we want the forms to speak for themselves in their use and value based on their intended context (a shop or studio setting), but we did realize we need to bolster our handbook and secondary materials. Our feedback primarily was about what we had anticipated: clarity (and the lack thereof). When talking about it, we were articulate about our project and our classmates and professors understood our intent. 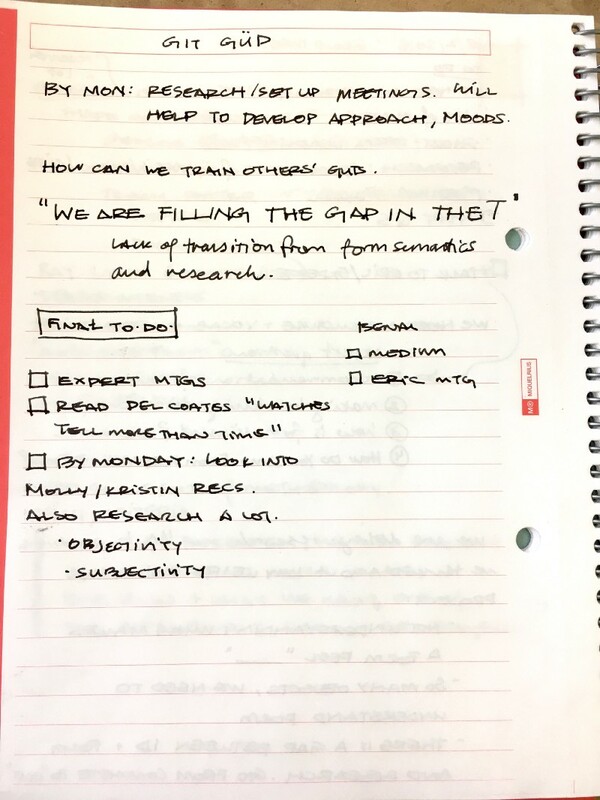 That being said, we realized that we need to structure our progress book and final deliverable in a digestible way to our class so that it can stand on its own without our involvement. There were a few pieces of critique that we acknowledged, but did not agree with due to our end goal of what this project should be. A few people wanted real world examples of how this kit would apply form to something. 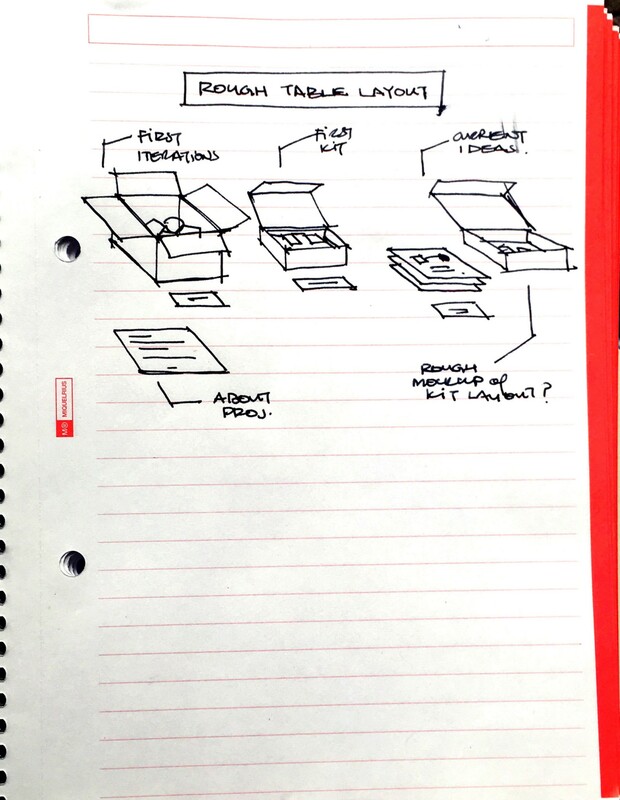 That is not our intent for this project, and the fact that we received feedback that said that means we were not clear in our intent: a discovery/play toolkit and library for product designers seeking to create intentional forms through interaction with the kit. It is not intended to analyze existing forms and show each element of those forms — it is intended to show how form changes and how the meaning of those forms evolve as it does. Our clarity of our intent, use of, and the value of our project are primarily what we want to focus on before the formal critique we have next Monday. 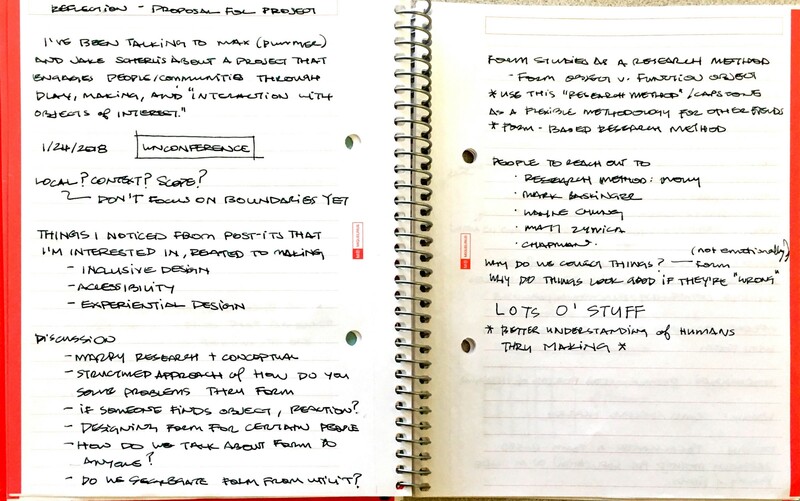 Today, we followed up on our critique with Mark Baskinger. 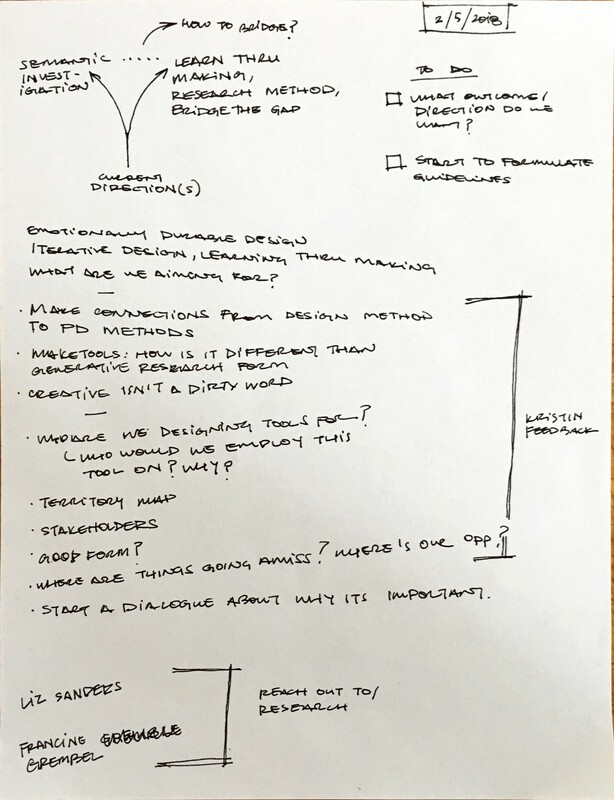 We wanted to meet with Mark because we were having some trouble pivoting and coming up with how to communicate the value of what we’re doing to non-product designers. Sometimes, it feels like we need to overly validate what we’re doing since it is so unfamiliar to the majority of the class. That being said, we know this is a valuable and important project and it was good to get Mark’s perspective on it. We talked a lot about the transitions between the tier structure that we had developed and how it perhaps was still tackling too much at one time. We had this issue before when we first started: starting with a little more than we could chew or communicate. 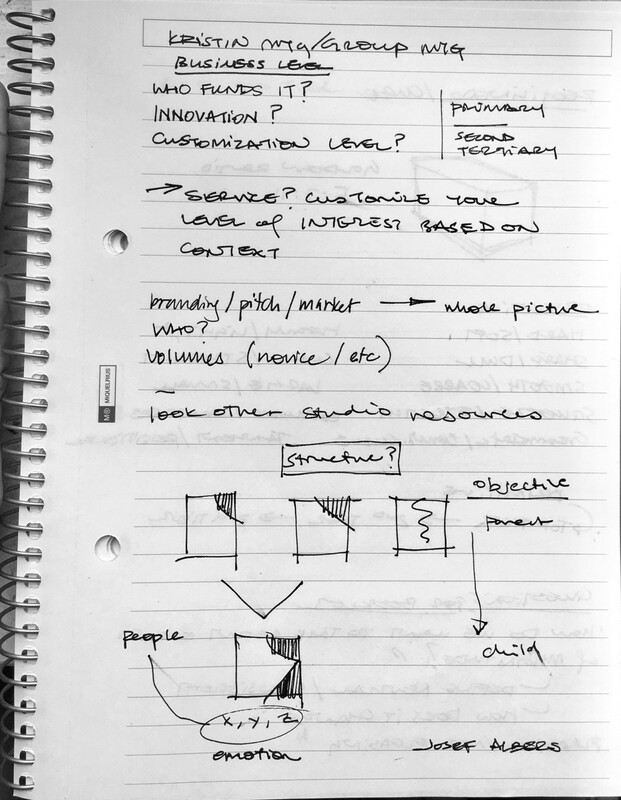 This time, we knew how to tackle it and peeled back a layer/refined scope for clarity’s sake. We decided to keep transformations of the same type in the top tier — for example, different degrees of “cut” would be grouped together. Then, in each subsequent row, we would show different intensities of those transformations. They would combine to not form a tier system, but a spectrum of different form. (see below drawing). 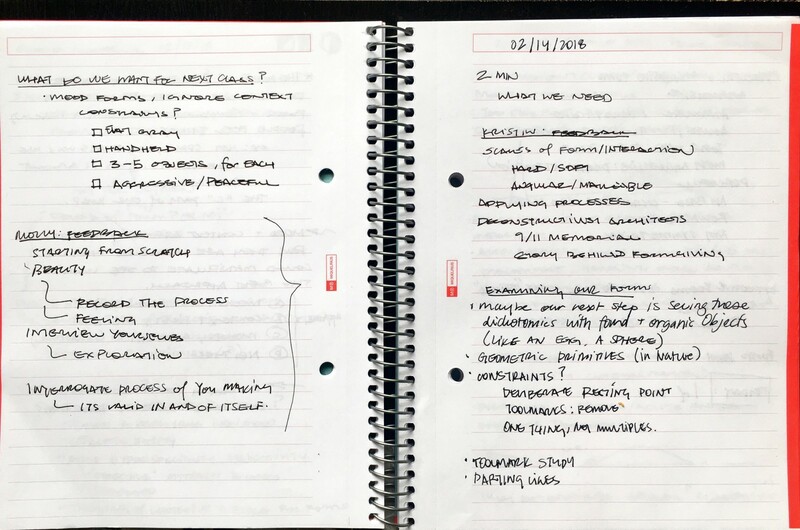 We’re still figuring this out and haven’t fleshed it out completely, but it is an attractive organizational method due to its grouping system and more systematic approach to changes in form. That way, it is clearer what is happening to the form in every grouping of transformations. a quick drawing of how the forms could change and be grouped within the kit. We also talked about how this set of forms should be interpreted by the viewers/handlers and how it should be presented in order to communicate its intent. 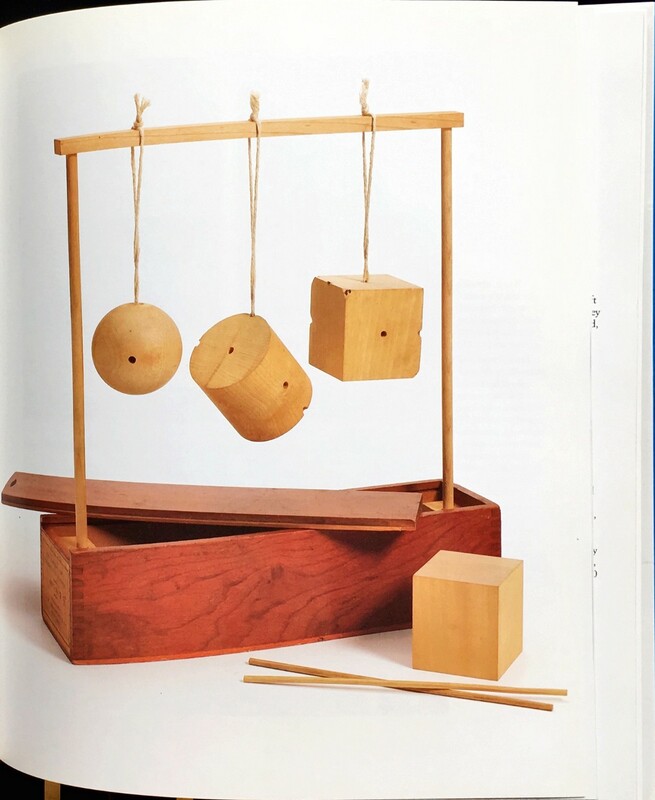 Mark showed us the work of Friedrich Froebels, the inventor of kindergarten and the father of “structured play.” The idea of play and discovery through form has been a key theme in our work, so we were very drawn to Froebels’ work and seek to incorporate into our framing of our work. 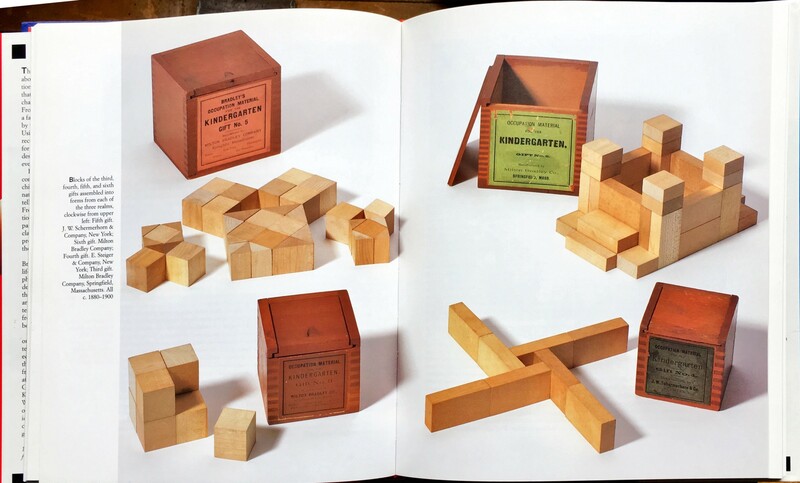 some examples of Froebels’ work from the book Inventing Kindergarten by Norman Brosterman. This is sort of what we’re aiming for. 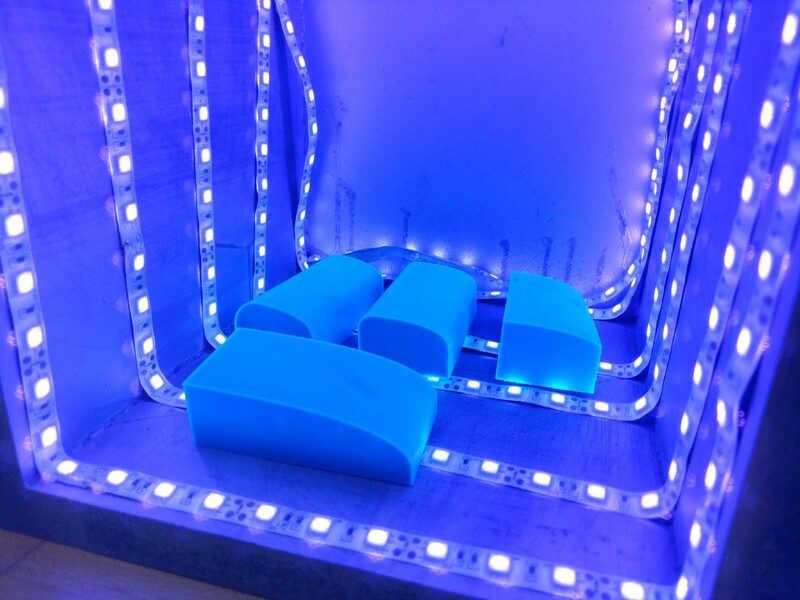 As for the presentation of our forms, we are thinking of having a literal playspace that contain the forms. 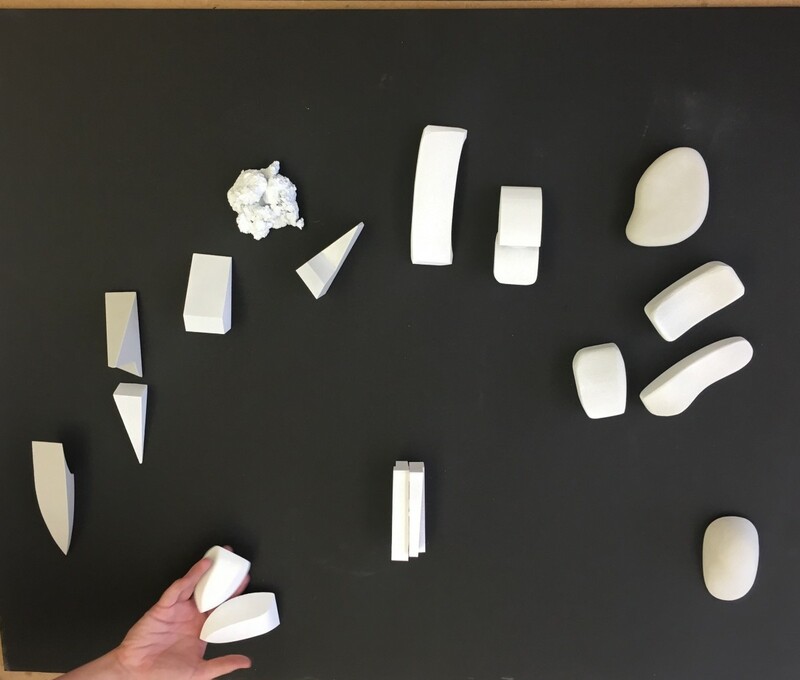 Each form would be grouped within the kit into its transformation group (aka, the “cut” group of forms) and would have a space next to it that would allow for viewing and interacting with the forms. 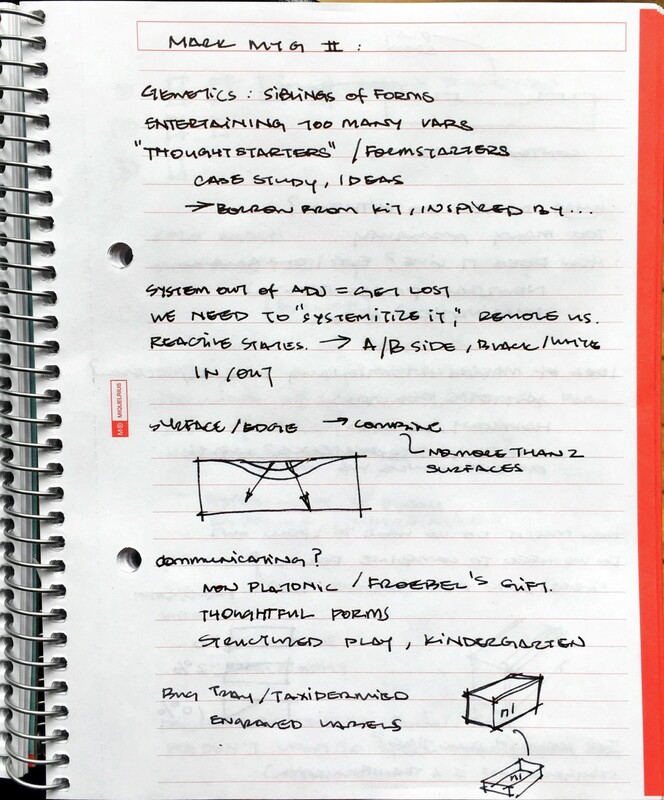 We would still have a handbook, but that would mostly describe our intentions with this project, how to interact with the kit, and the philosophies behind this work. As stated in a previous entry, we want these forms and this kit to speak for itself within its intended context. 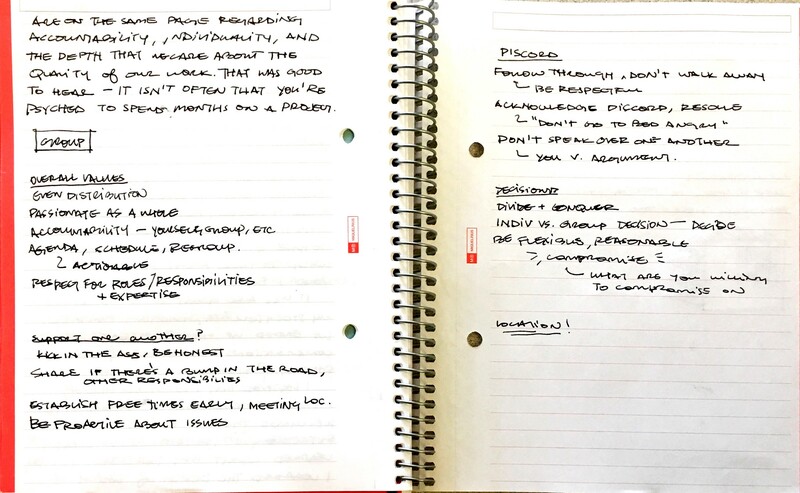 Over the next few days, we intend to discuss how we’ve pivoted and restructure and reroute ourselves based on what we’ve discovered in the past few days. We are incredibly excited to keep moving forward and were definitely re-energized by the silent critique and the meeting with Mark. Stay tuned! A lot of the feedback we received was about clarity — of how to use the kit, its intended purpose, and its value. I think we got so excited about this project that we forgot how to articulate these things clearly. breaking down what our problem statement/needs satisfied are during our meeting. What is the problem being addressed here? 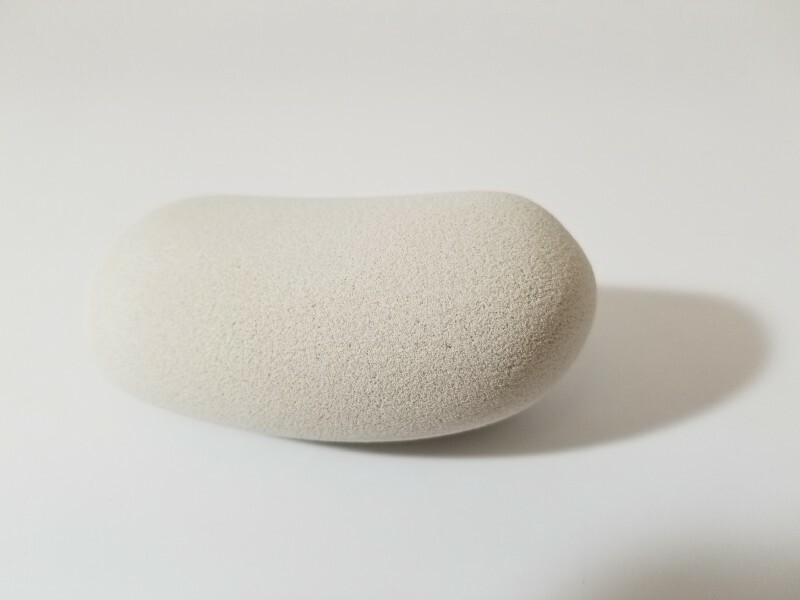 Young product designers in training have less sensitivity to form and must create form to understand it, but building up that kind of sensitivity takes years. 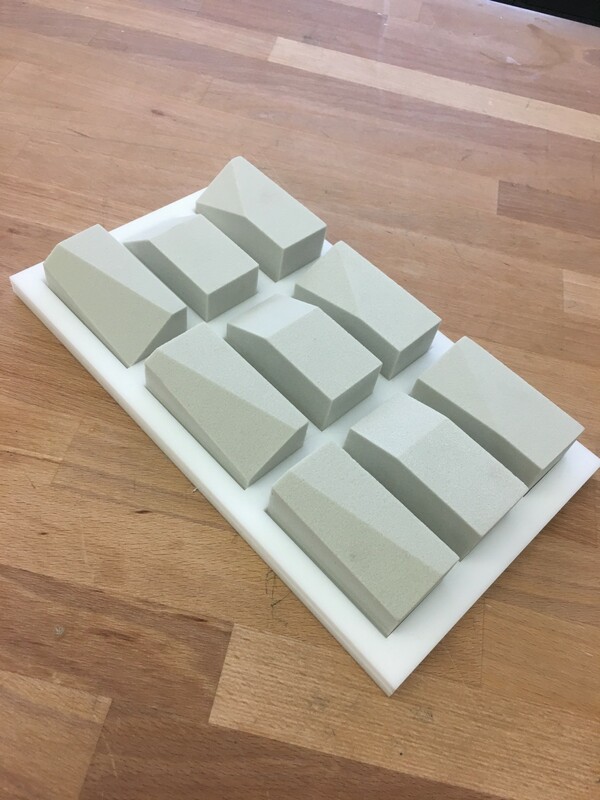 This kit is intended to intervene in the product designers education as a catalyst to teach sensitivity to form as an addition to making. What are the needs satisfied here? 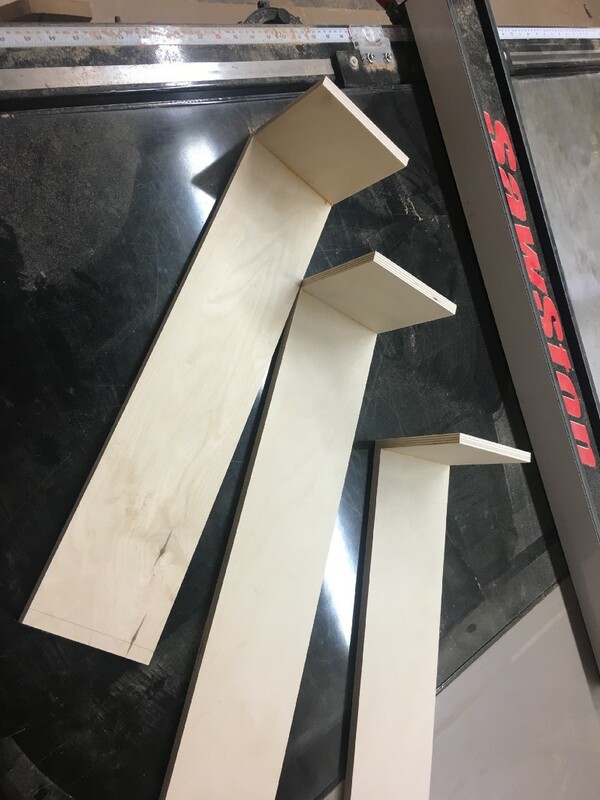 What value does this project bring? 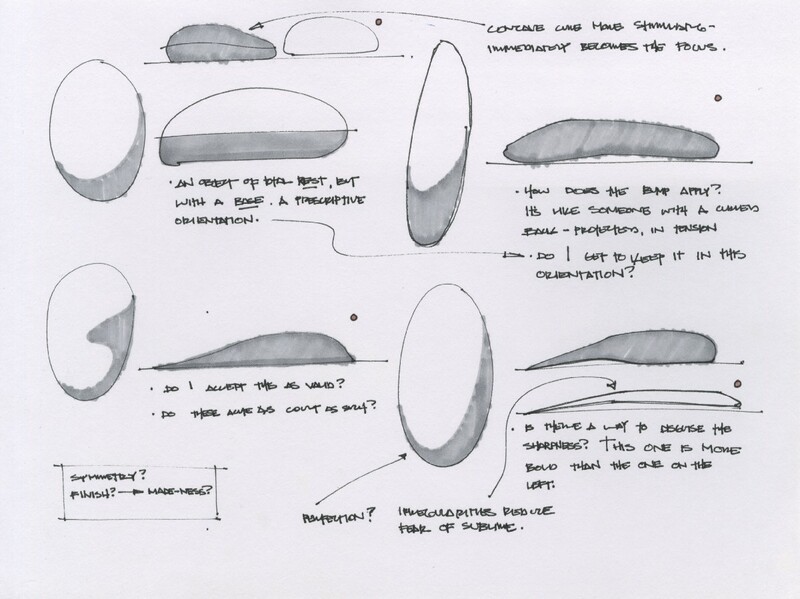 In order to emphasize the importance of product design, a sensitivity to form must be developed and bolstered. 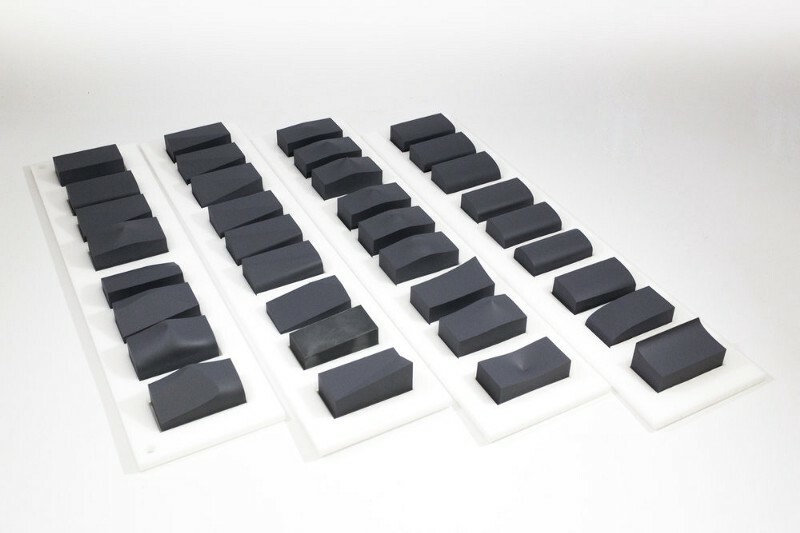 This project aims to do just that through exposure to a physical, tactile kit of forms that seeks discovery through play. 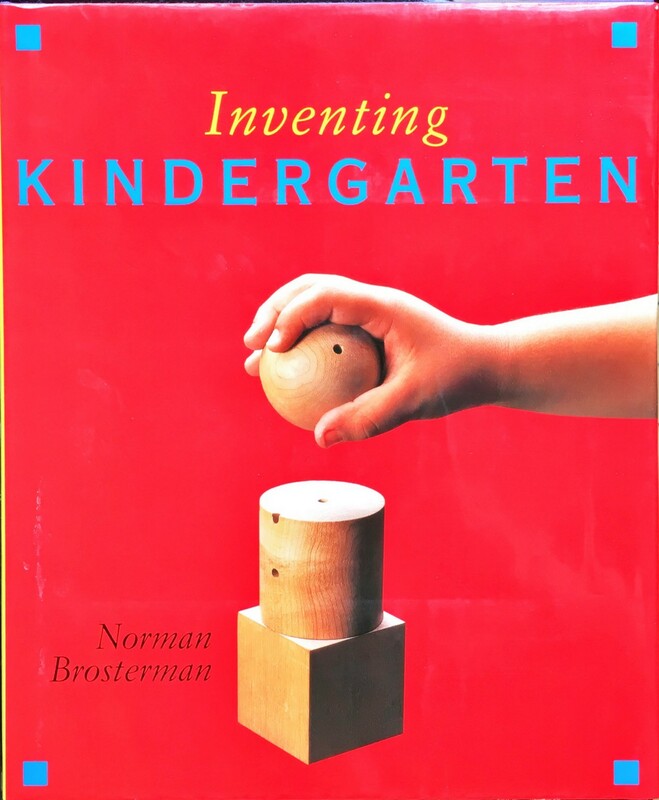 Just like Froebels did with kindergarten, we are providing discovery through structured play with physical artifacts. Why is something like this necessary? There is a depreciation of value in product design due to an increasingly digitally oriented world. The exposure to a constant stream of non-tactile experiences lowers the sensitivity to form each incoming group of amateur product designers. Appreciation and sensitivity to form keeps us tethered to the world around us. 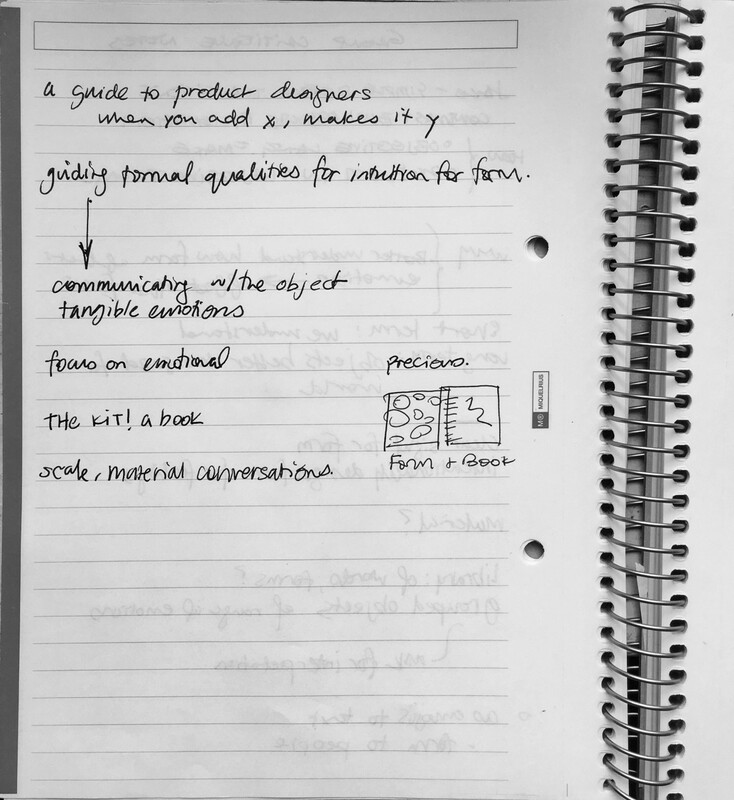 Our group is passionate about keeping these elements of form alive within product design education. We also had a long discussion about what we wanted to bring to the critique tomorrow and had to make some challenging decisions regarding some things we wish were finalized by now. Our talk with Mark helped us pivot, but it also raised more questions that we’re not ready to answer quite yet during the critique. 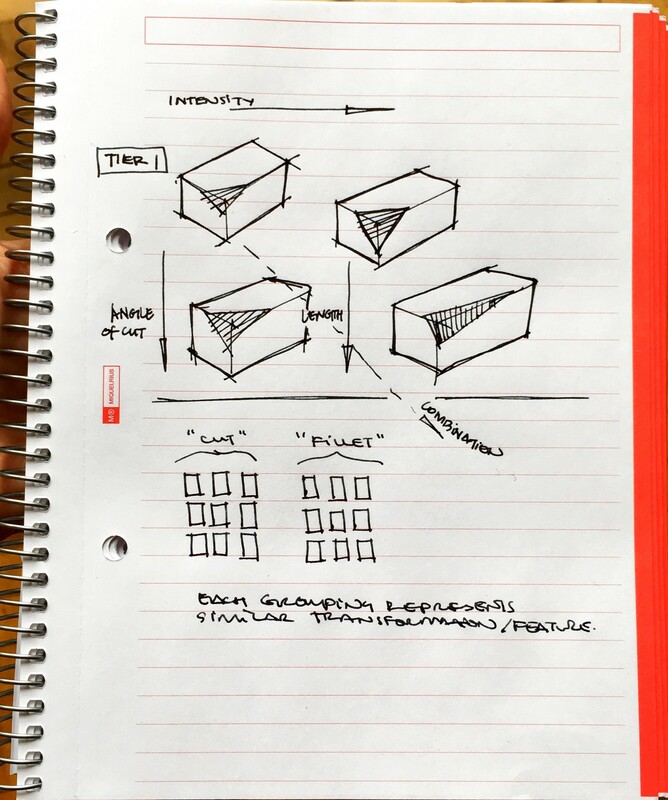 Our main concern right now is the structure and content of the kit: the physical forms, their arrangement, and how the hierarchy and transitions between forms are structured such that it is understandable. 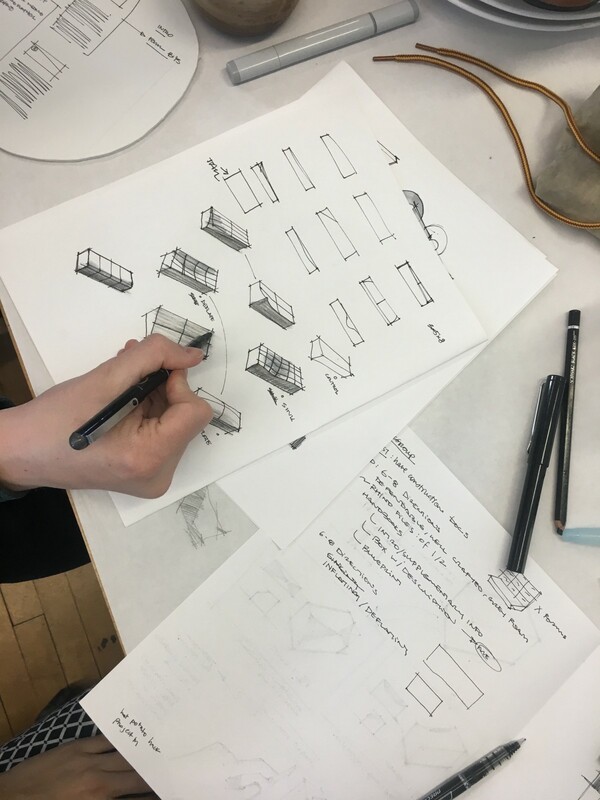 We have a few different and new ideas for the structure that we’re going to articulate through some drawings, physical, and CAD models. We are going to have our Medium on display as our process book, but print out a nicely formatted guide to our project that outlines our problem statement, values, etc. Our handbook is incomplete and is not branded, so we’re unsure whether to even include that during the critique other than to mention it will exist with the final kit. 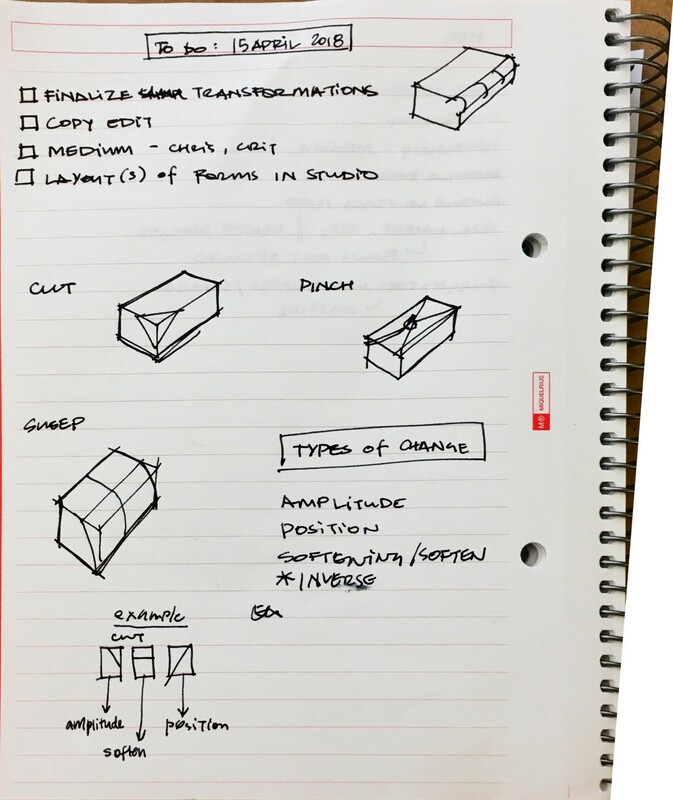 some low-fidelity information and drawings about the structure of the kit. We’re aiming to keep the items on the table to a minimum, mostly because we think that the sheer amount of content we had out during the critique confused people. We hope that this layout provides plenty of things to talk about during the critique and we’re excited to showcase our project! Our critique today was very helpful and successful in reaffirming some of our improvements and providing further feedback to help us move forward. 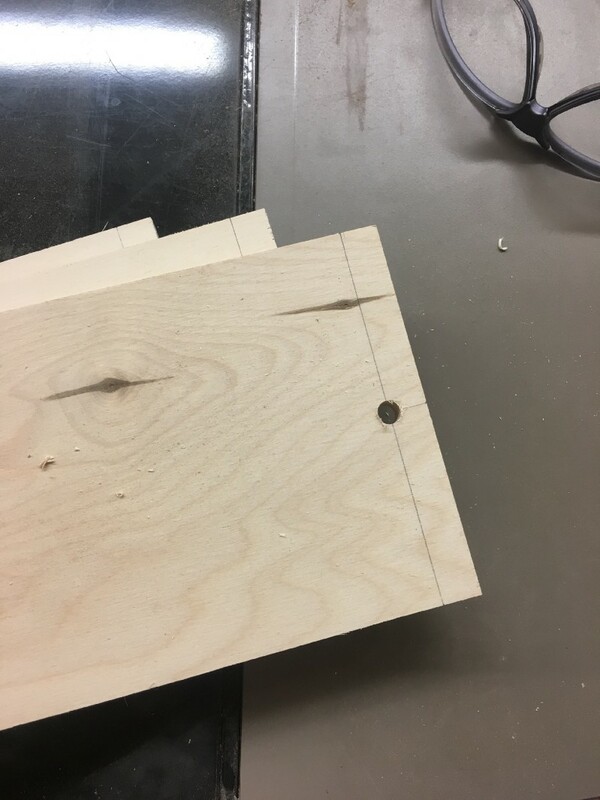 We did take note of the lack of clarity from the last critique and made sure that our intentions in our project for this crit were made entirely clear. 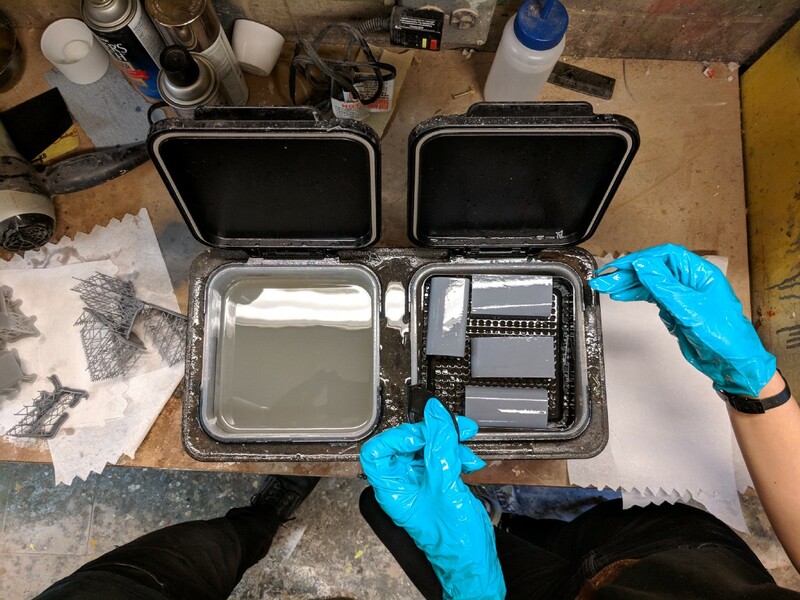 The main pieces of feedback we received was about our audience and if this kit could appeal to a wider audience, as well as the lack of voice within the kit. The use of the phrase “sensitivity to form” confused people, mostly due to us not defining the terms well enough. We asked about the clarity aspect and our proposed new layout of the forms and received really positive feedback, which affirmed our direction. We definitely gathered plenty of feedback to help us redefine some of our desires and intents, like the issue of audience. We will continue to regroup and discuss our findings during the next class session. We met today to have an intense group session about our direction and schedule until the end of the semester. Our next thought was what we wanted our actual deliverable to be based on this conversation. 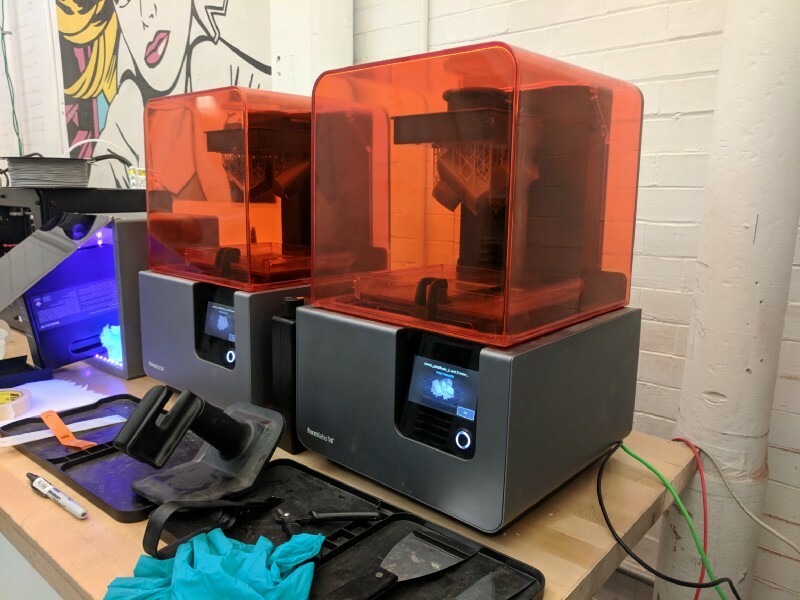 We definitely wanted the kit to be a permanent, visible tool within a studio space, so we thought about the kit living in the Porter Hall product studio. 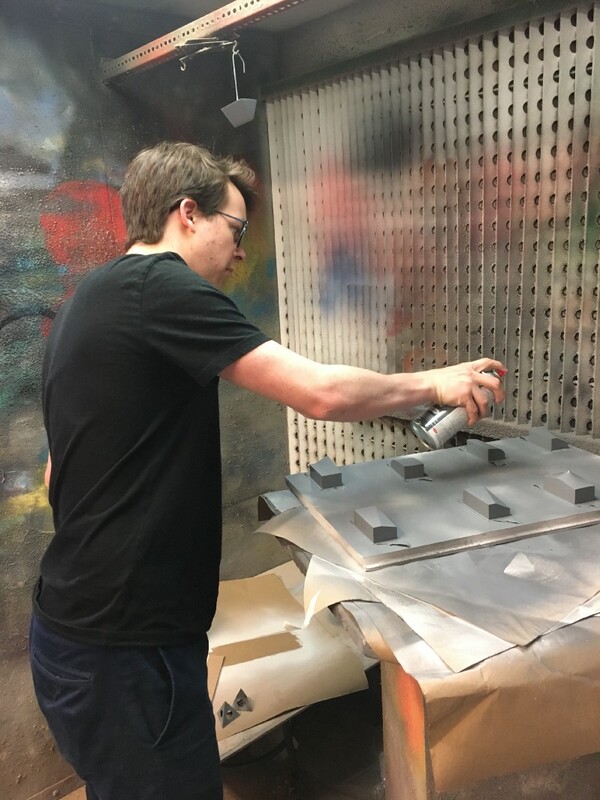 We met with Chris to talk about the possibility of this being a permanent installation within the studio and he was incredibly supportive, suggesting first and foremost that this be a visible, wall-mounted kit that was secured in some way to prevent theft/loss of forms. 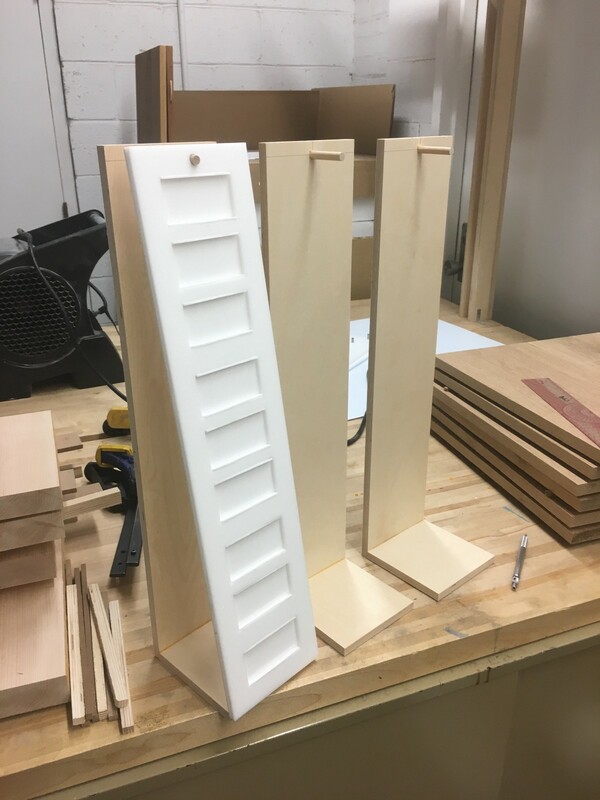 We are considering mounting the kit on the room dividers that face the sophomore/junior product student desks within Porter hall. 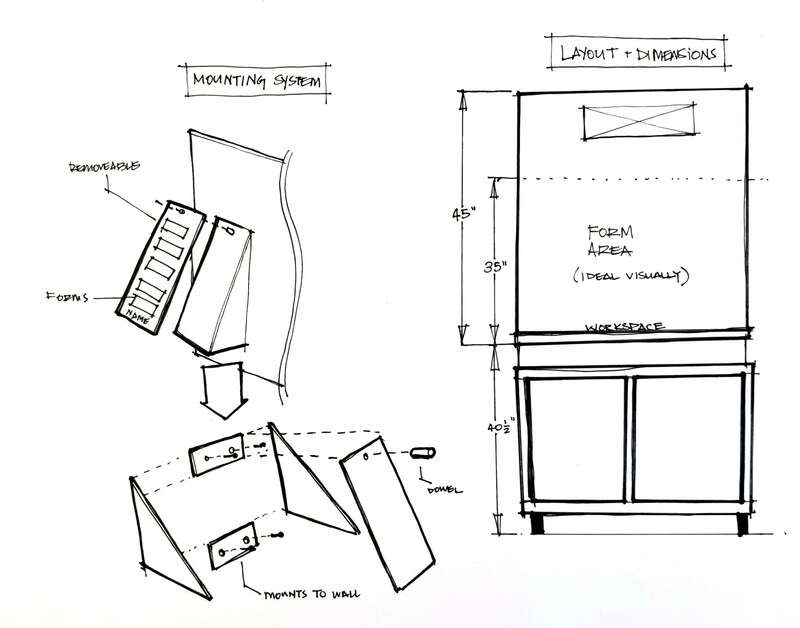 The forms would be visible through a clear acrylic sheet, but would require Chris to unlock the secured box/cabinet that the forms are contained within for access. We’re incredibly excited to create this kit and share it with students who are still in the formative part of their product design education, especially within the studio that we started our own education in. Today we focused on finalizing our layout/organization of our kit, as well as the transformations we wanted to explore. 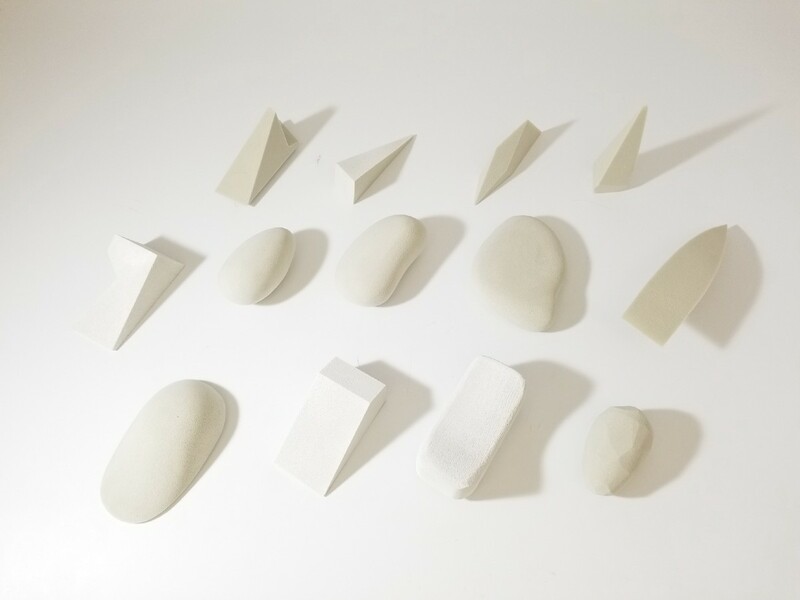 We will not be making another foam iteration because we are aware of its fidelity and want to focus on our final material choice. 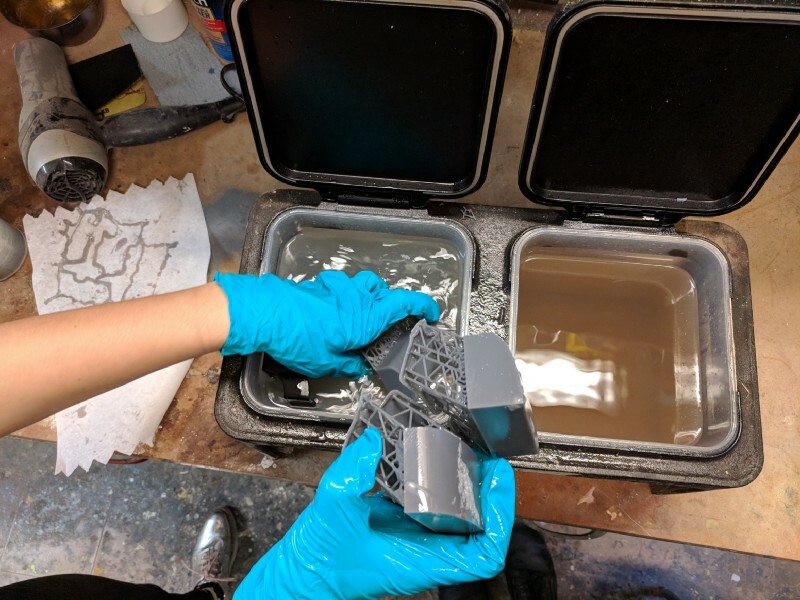 We’re probably going to go with SLA printing for the finalized forms since it is easily produceable in the shop and it gives the appropriate fidelity for our forms. We also decided the final transformations we want to explore are Cut, Sweep, and Pinch. The 3 applied changes we want to apply to these transformations are amplitude, position, and softening. 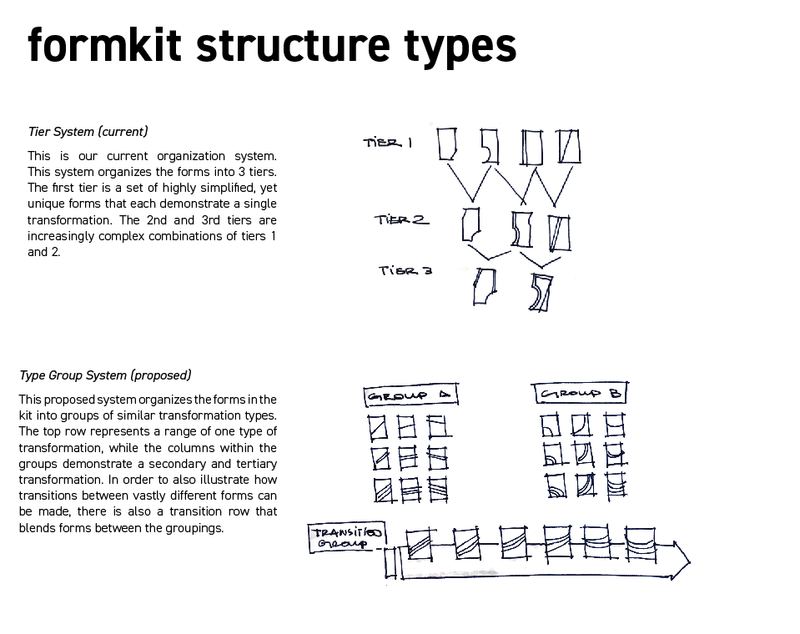 We’ll also include an inversion and transitional types of each form within the kit (see drawing below). 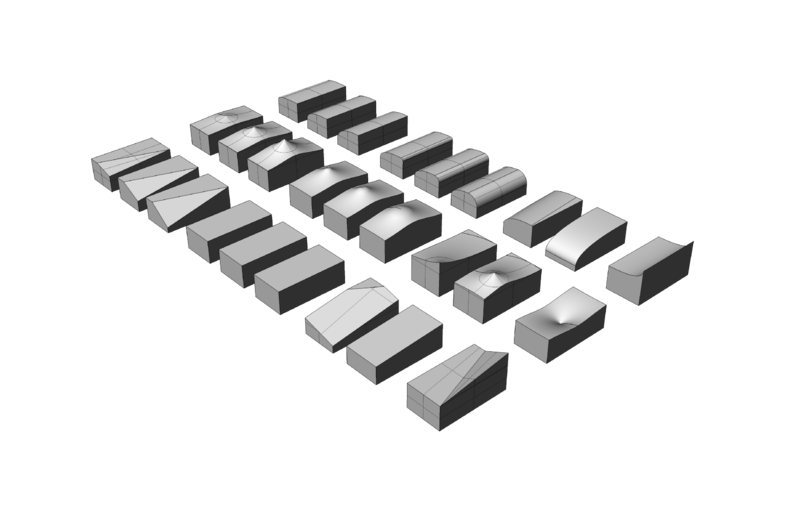 Our first iteration of the full set of forms, modeled in Rhino, are below. 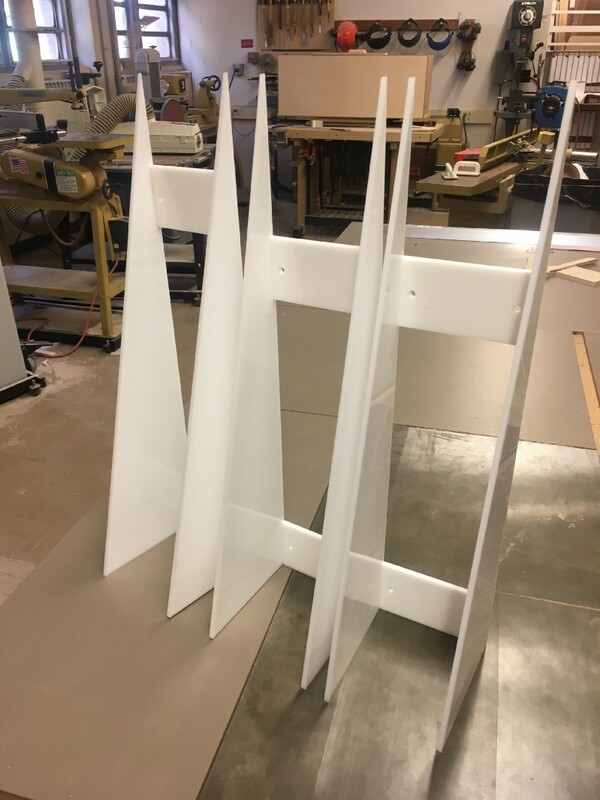 We’ve been brainstorming how to mount these forms to this board in a highly visible way that allows for the expansion and accessibility. 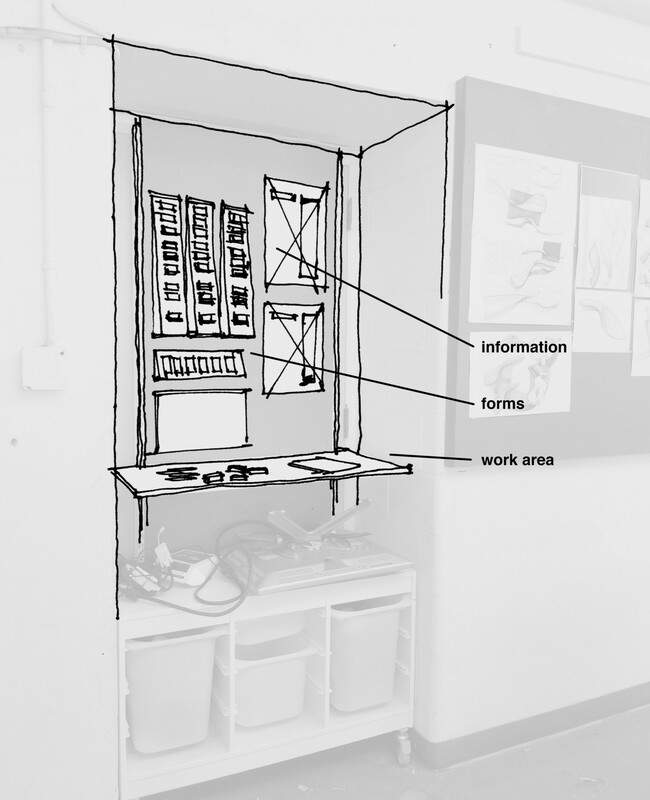 We also want the forms to be removable such that students may take groups of forms and observe them at their desks. 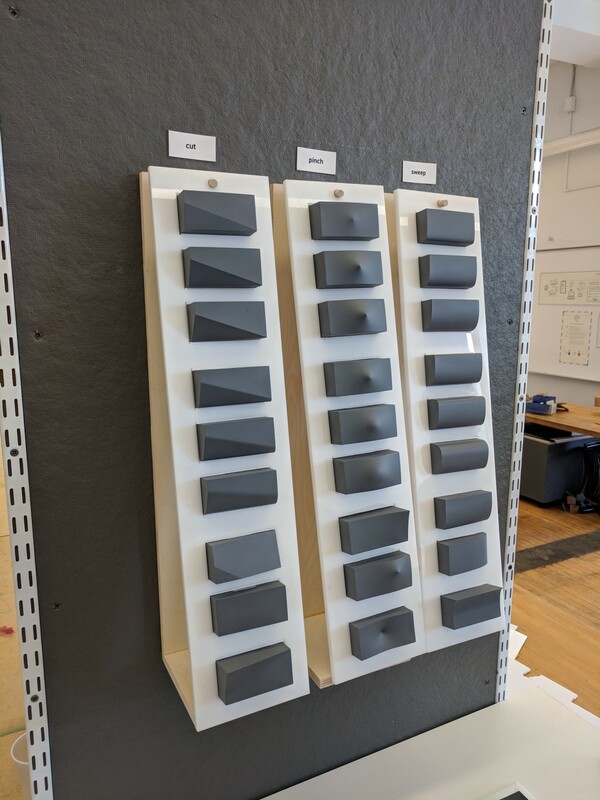 Our current successful mounting iteration is below, along with our ideal dimensions of how the system should look and be set up within the physical space. Today we wrapped up our capstone project! It was amazing to see all our hard work come to a close this week. Our group is incredibly proud of the work we did and the legacy it will leave on the School of Design. 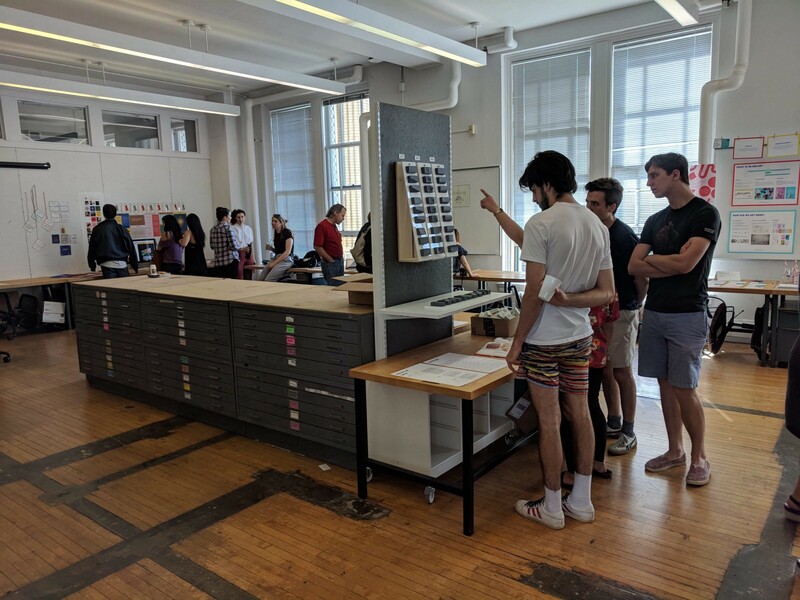 Students of all backgrounds and years were excited to interact with the forms and learn how they were made, how to use them, and the value of the project itself. Professors also were interested in using our project as a launch point for other projects they wanted to develop within their curriculum, which was our stretch goal. We are so, so deeply grateful for the interest everyone showed in our forms and to see that our project had such a positive and deep impact on those who saw it. 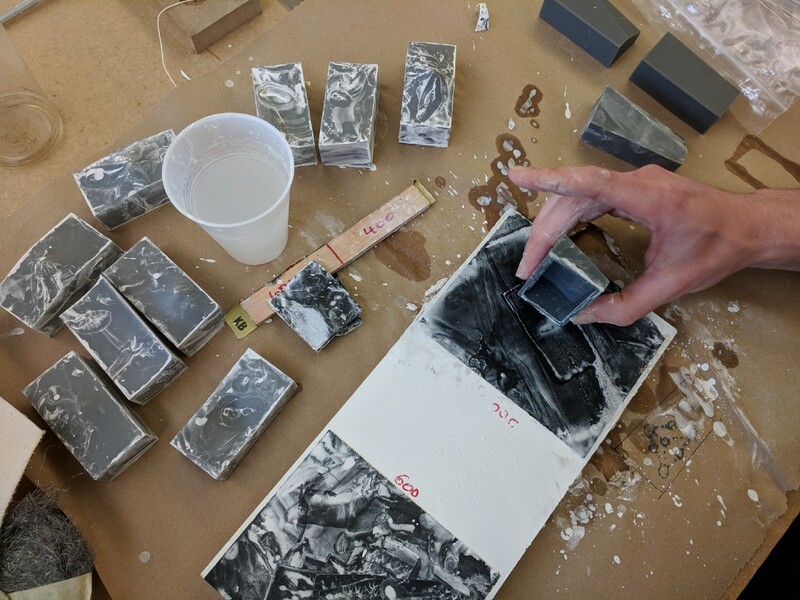 We hope that this project leaves a lasting legacy at the School of Design and its product design curriculum, encouraging incoming designers to make, play, and continue to challenge and push themselves to explore form. Thank you for reading this Medium blog. To see final documentation of this project, visit maxplummer.com/form-library.